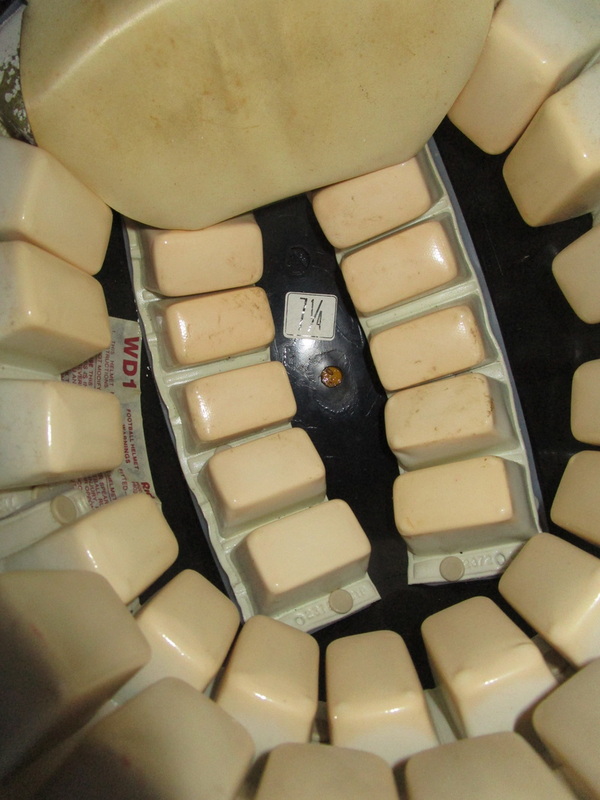 Please click on the pictures to enlarge the photos. 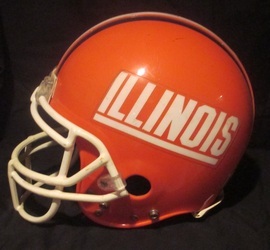 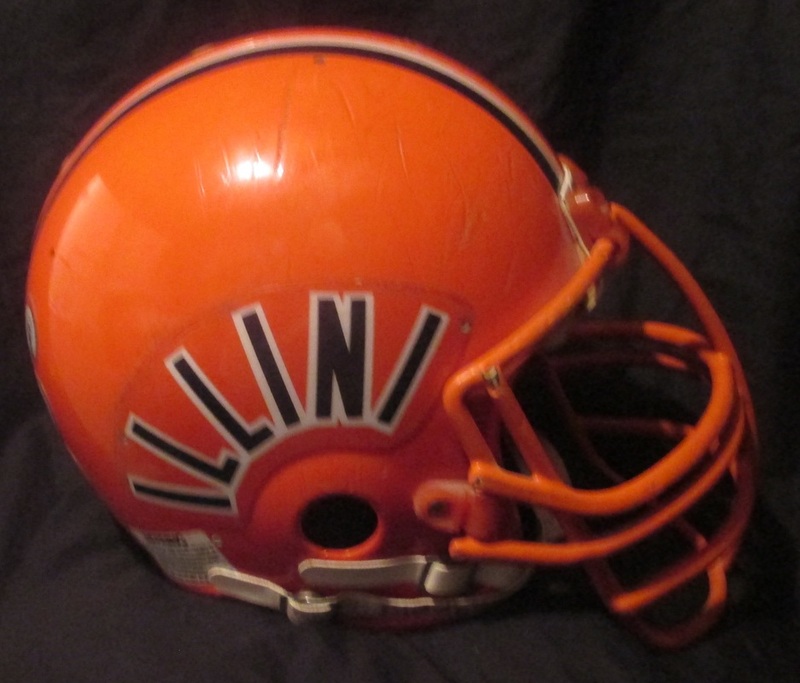 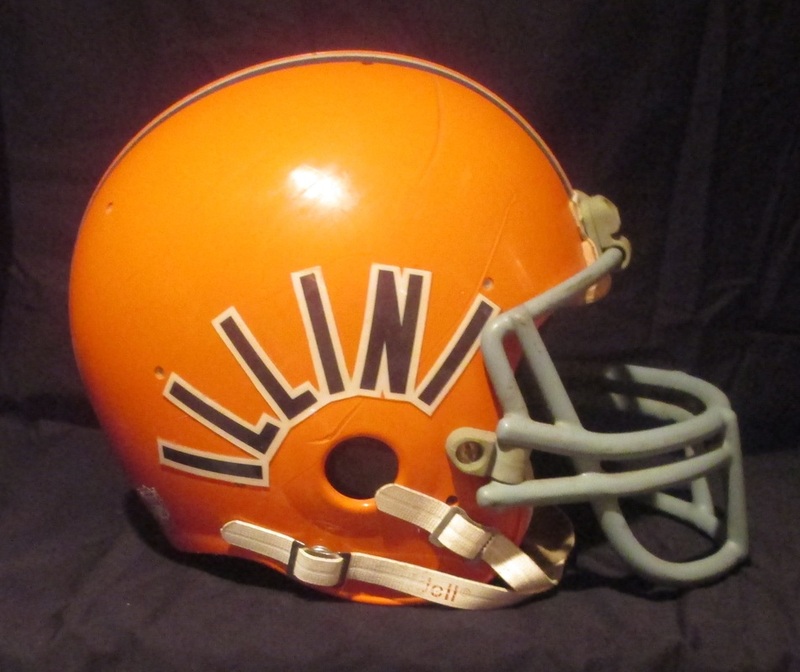 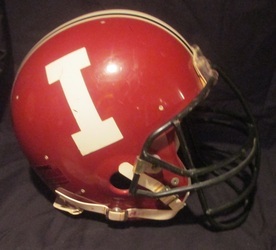 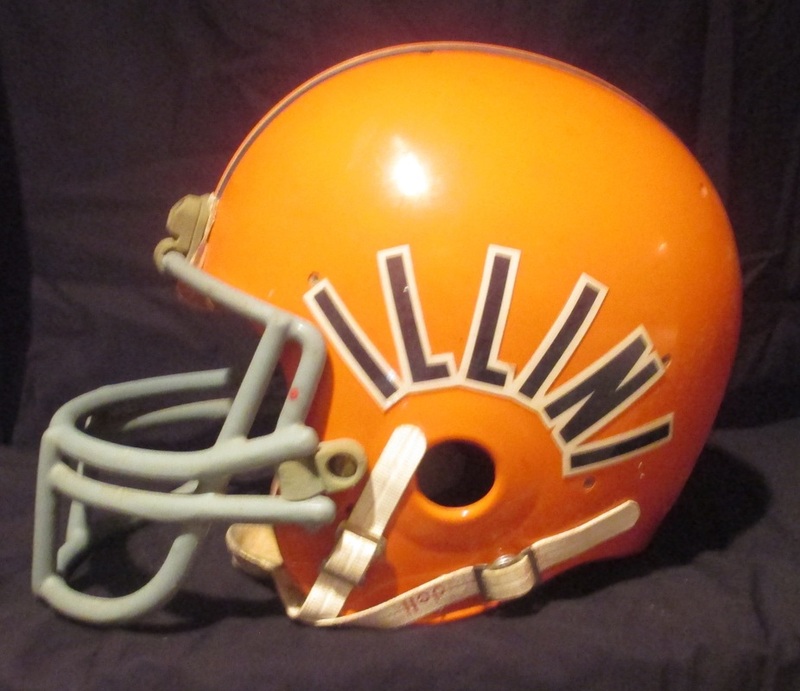 Illinois Illini early 1980's helmet. 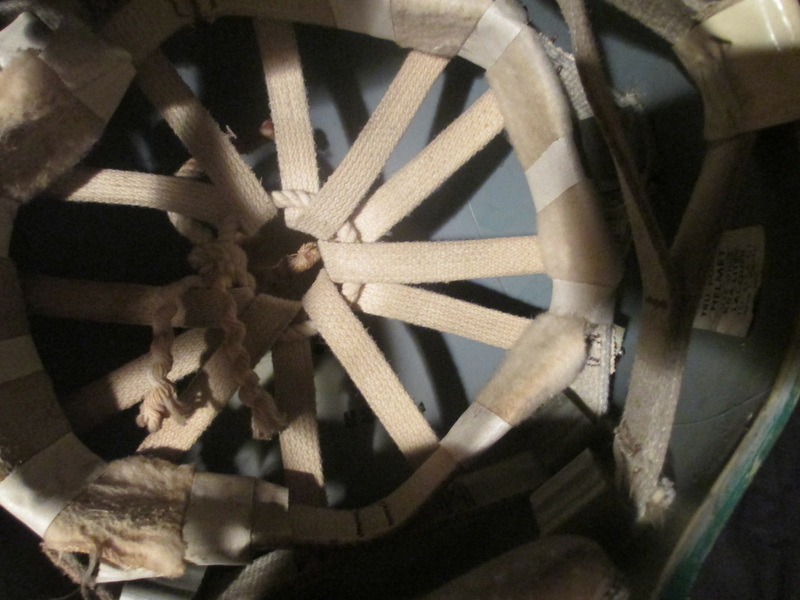 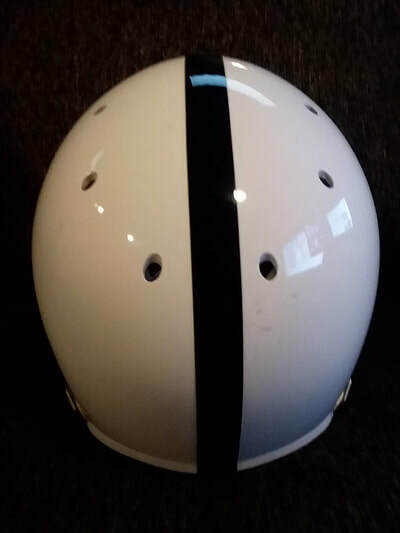 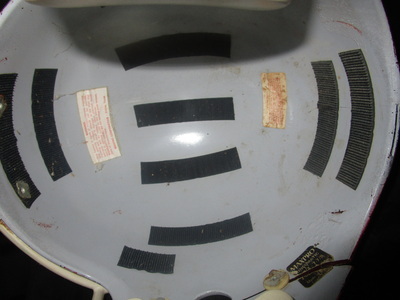 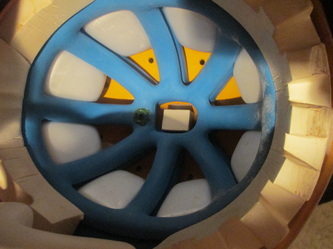 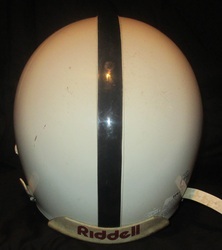 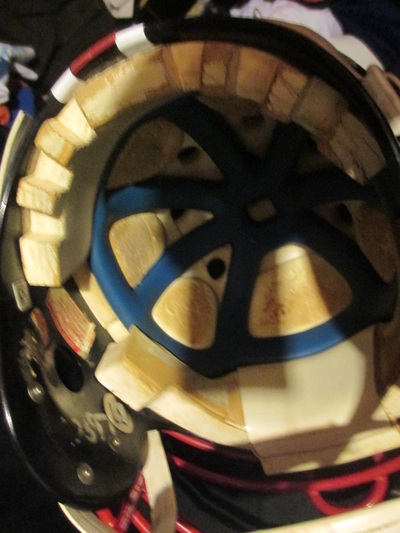 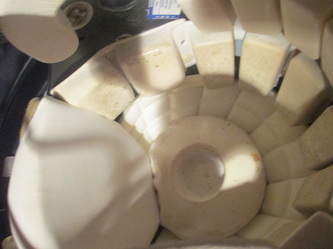 The blue stripes are wider on this particular helmet, when normally they were about half the size of the white stripe. 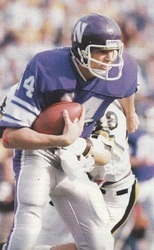 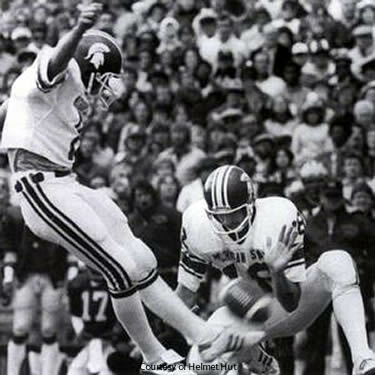 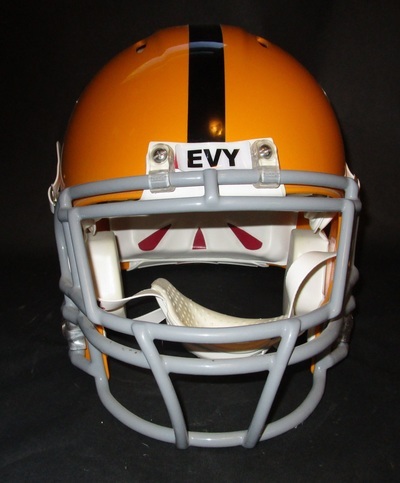 Tony Eason can be seen below with this type of striping on his helmet, which is unusual. 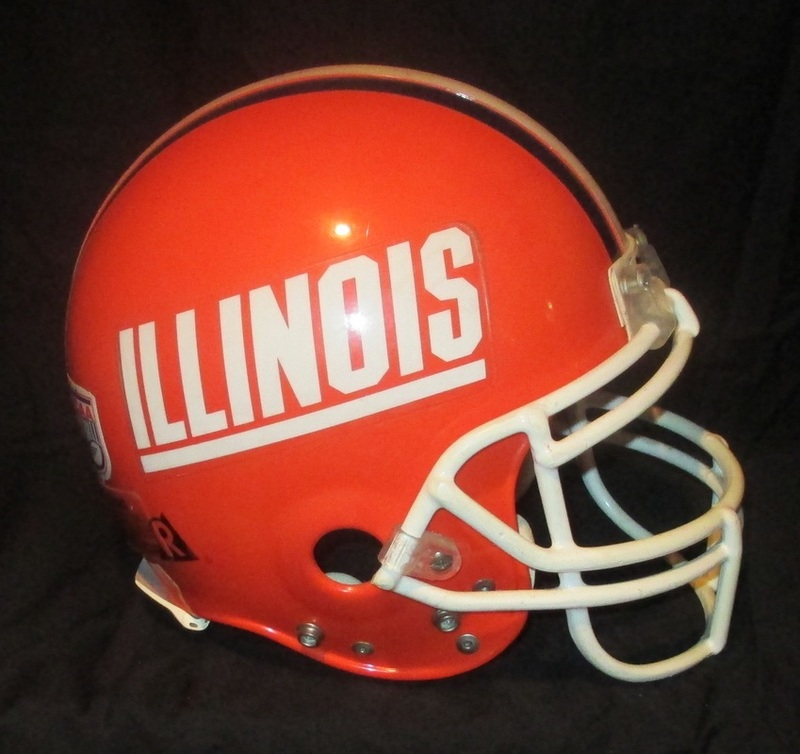 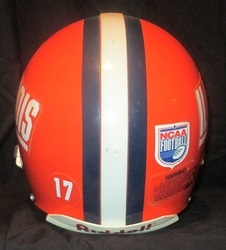 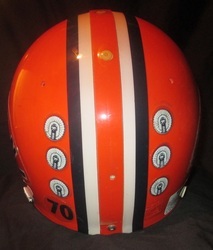 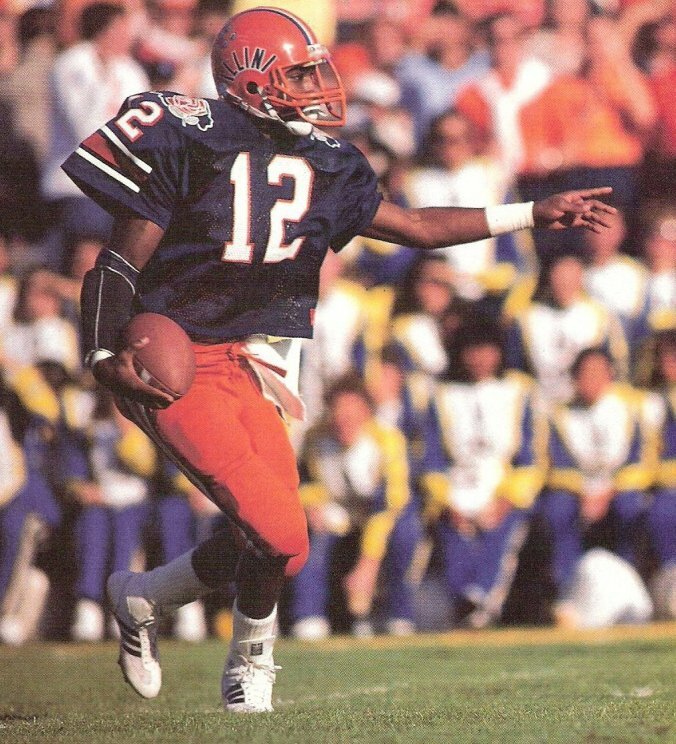 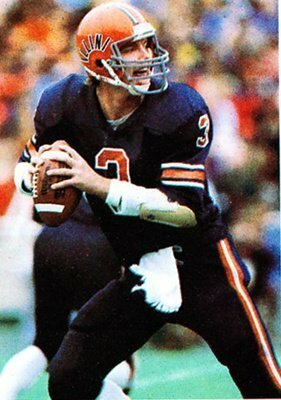 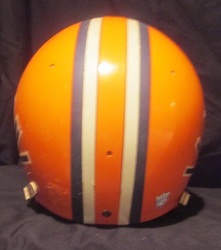 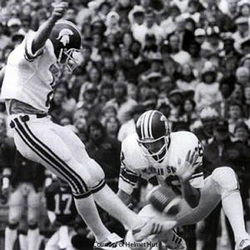 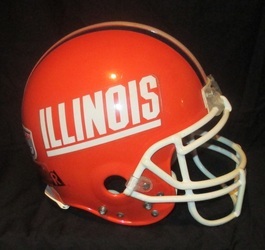 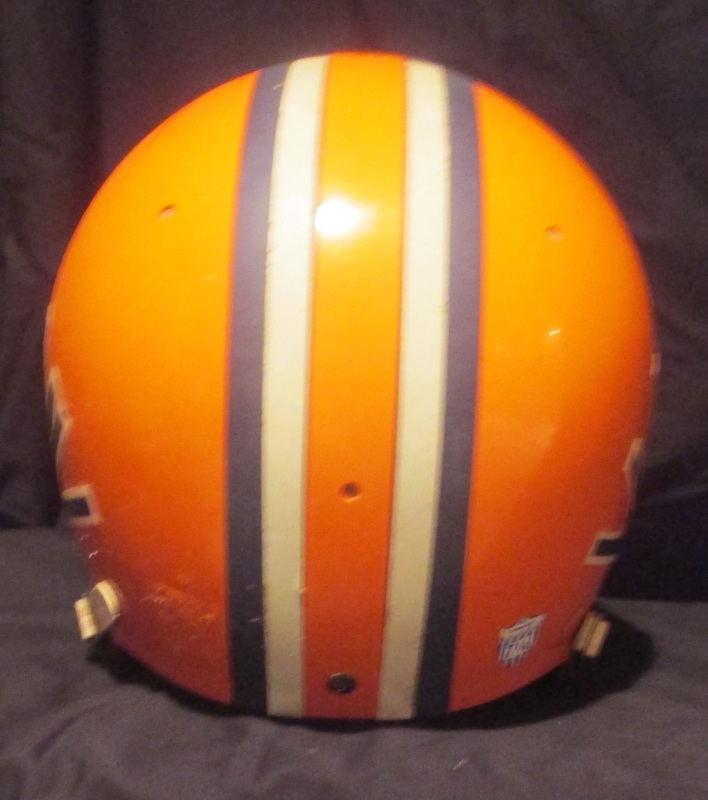 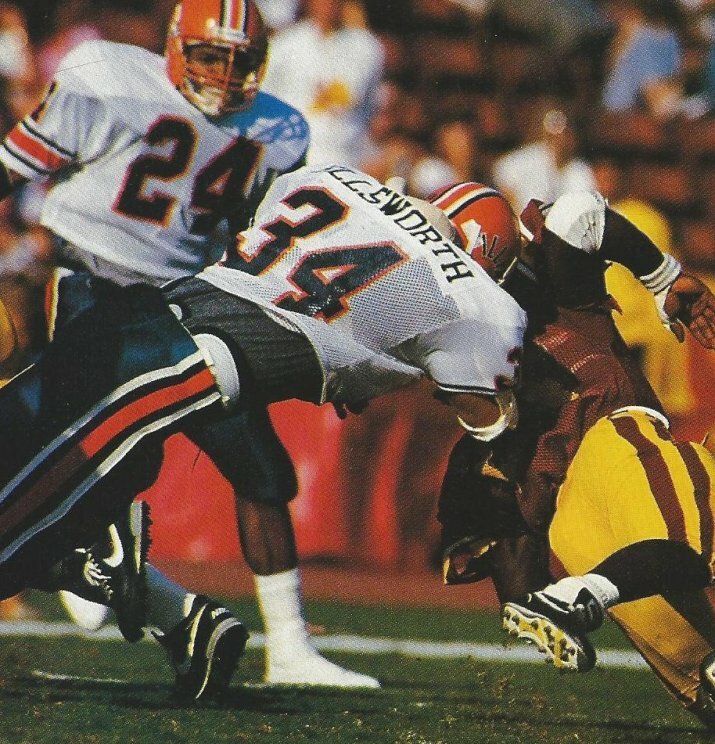 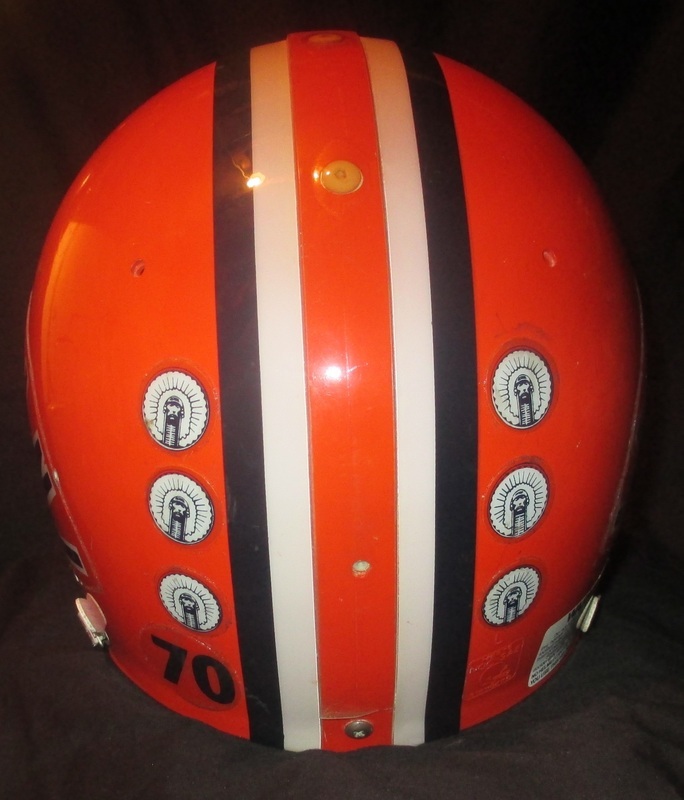 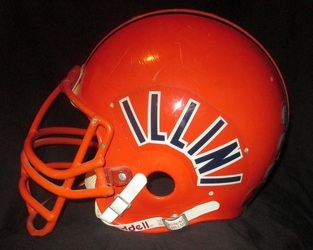 They went to this type of stripes on the helmets used from 1983-87 when the Illini switched to the orange facemasks. 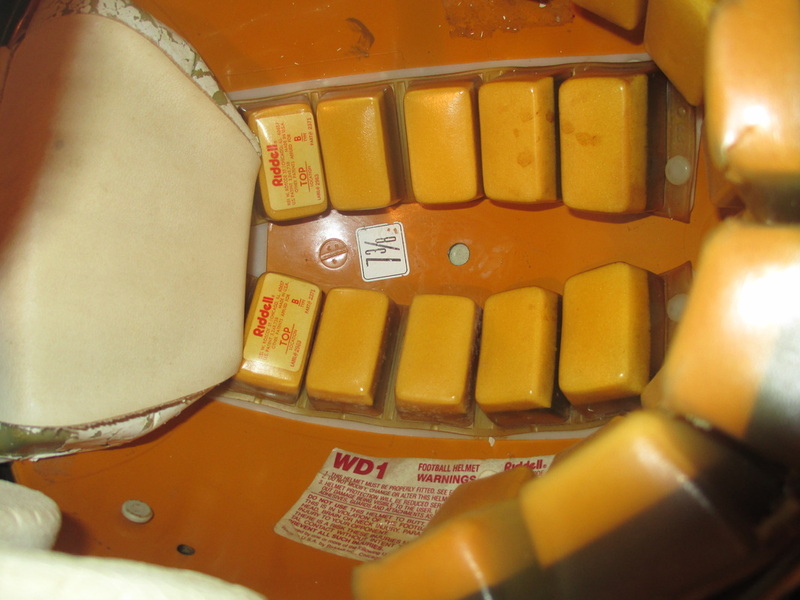 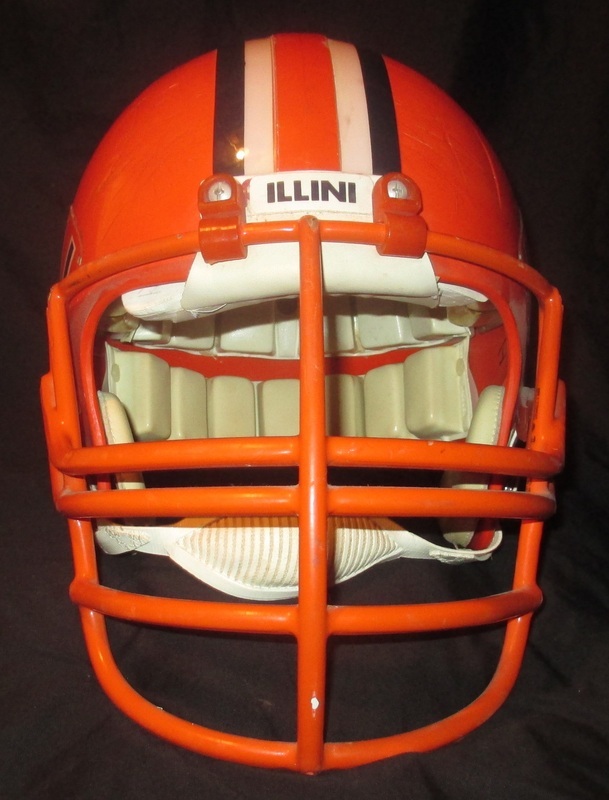 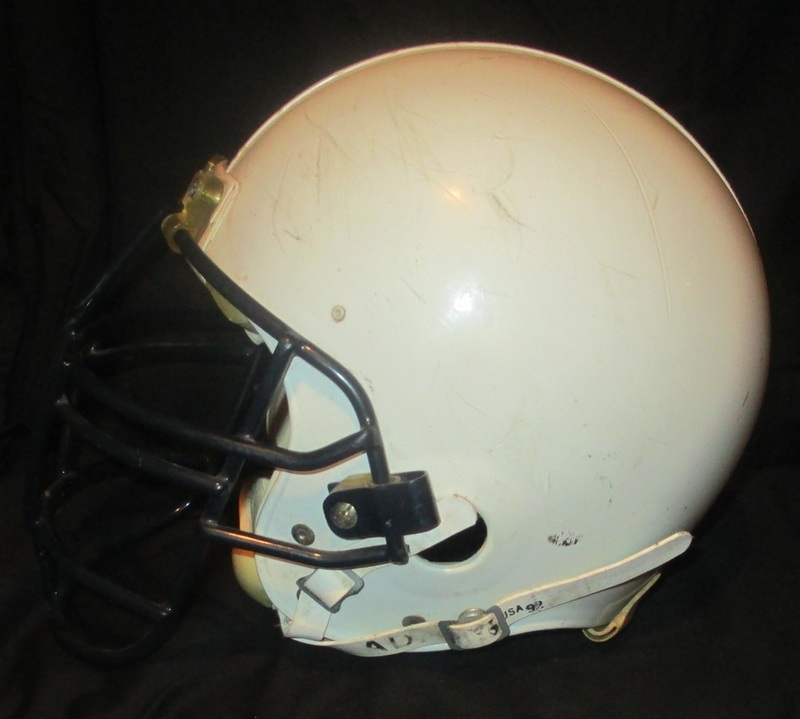 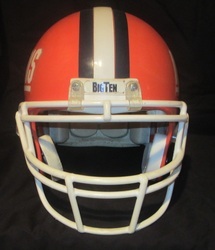 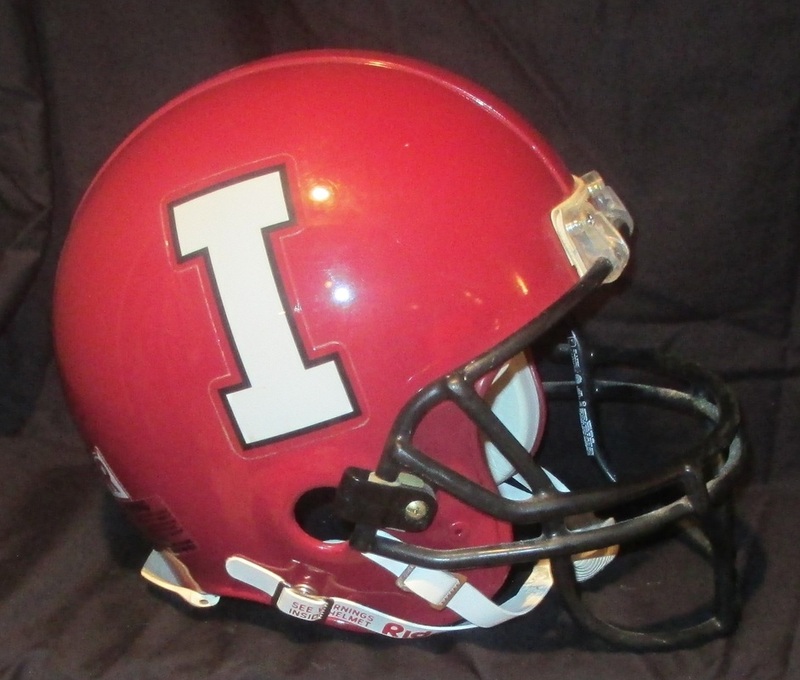 Illinois Illini 1986 Riddell AF2 model helmet, likely worn by Tom Schertz, #70. 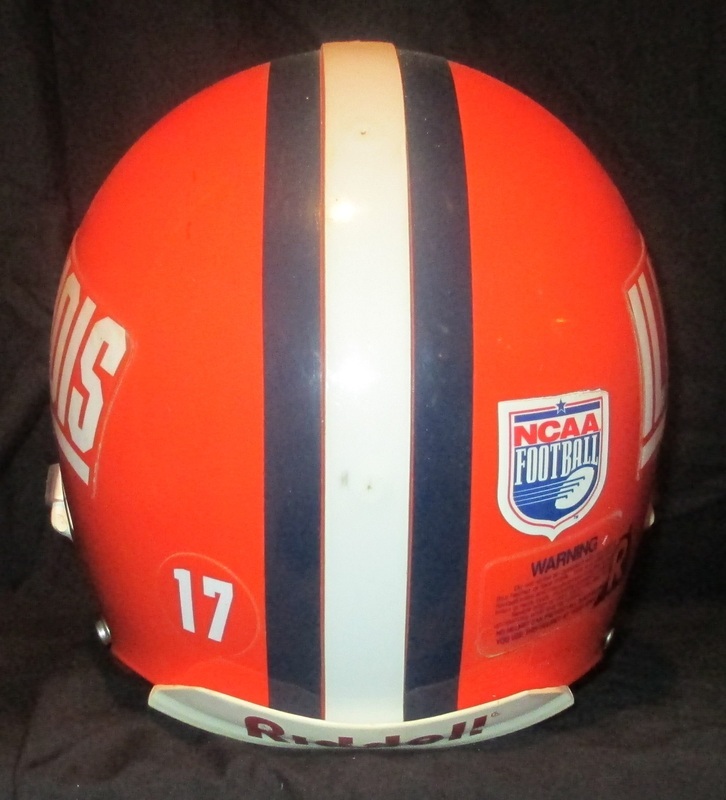 Illinois Illini 1997 Riddell VSR4 model helmet, #17 with NCAA decal on back. 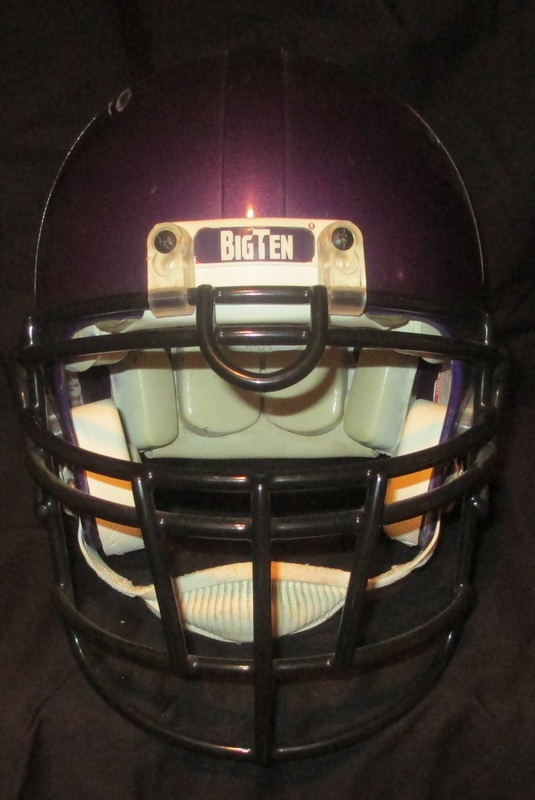 This one came straight out of the equipment room at the end of the 97' season. 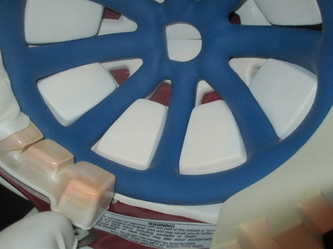 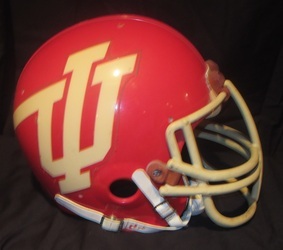 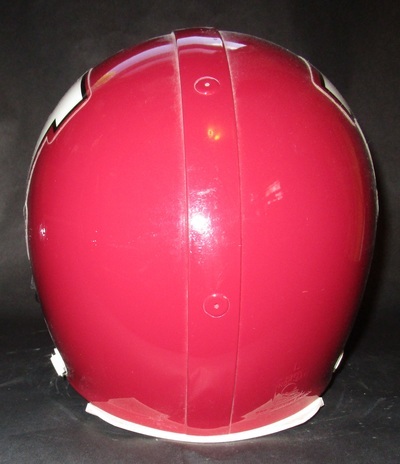 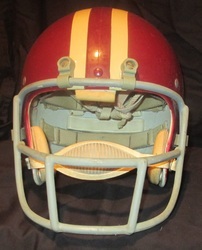 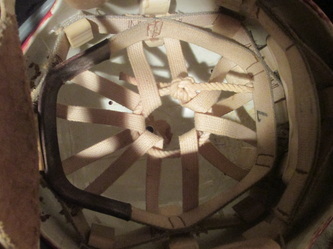 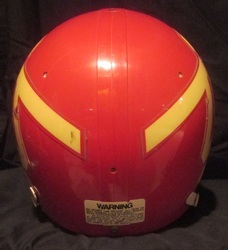 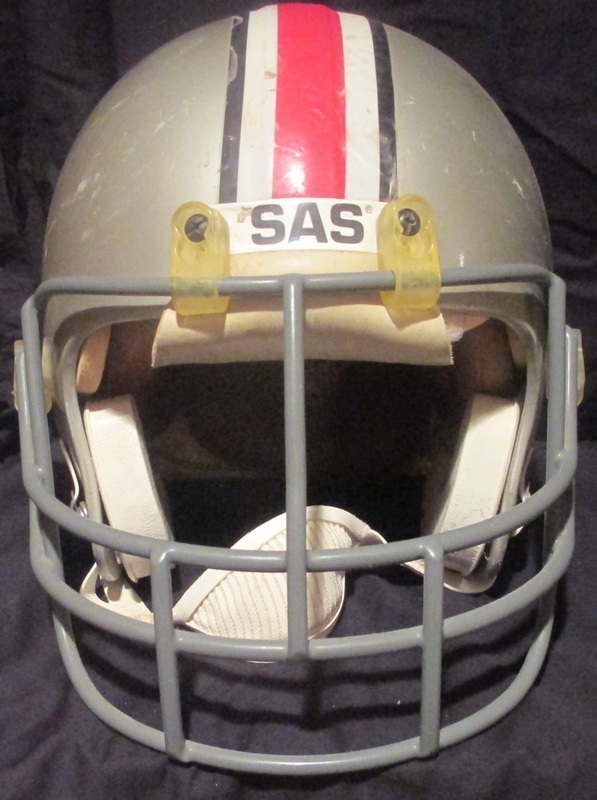 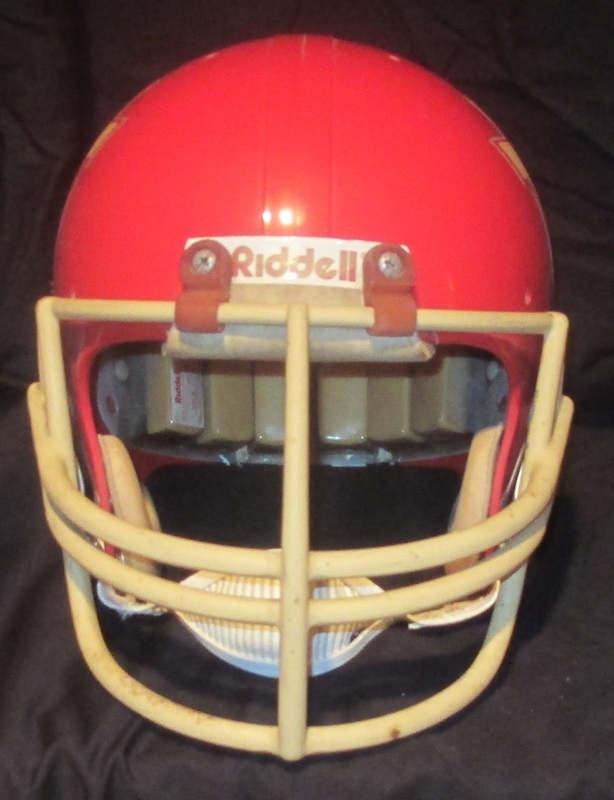 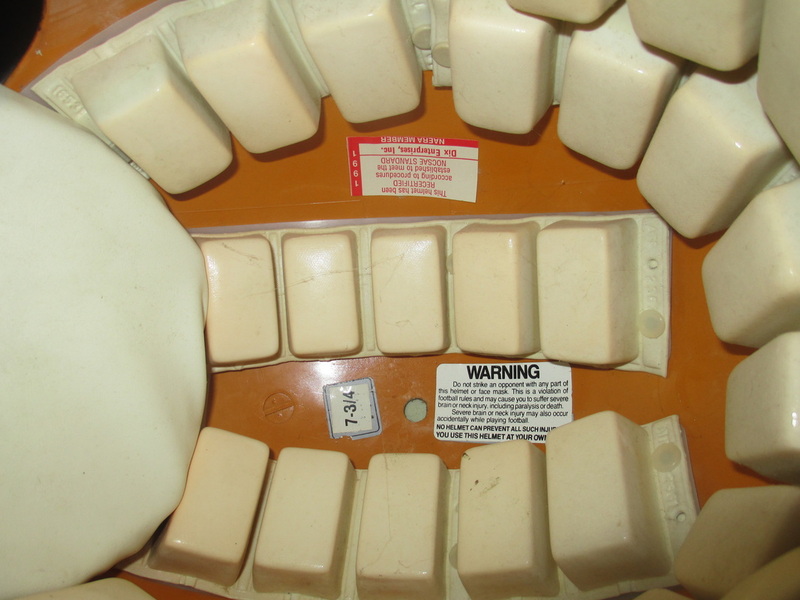 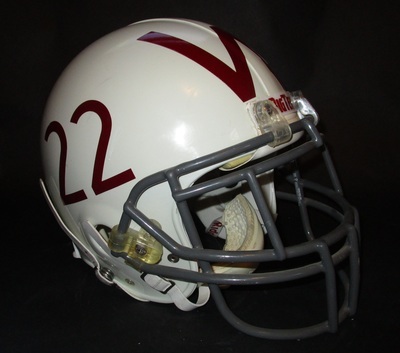 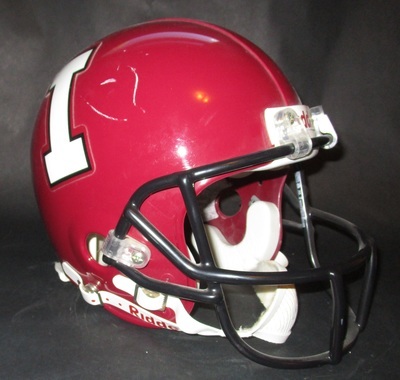 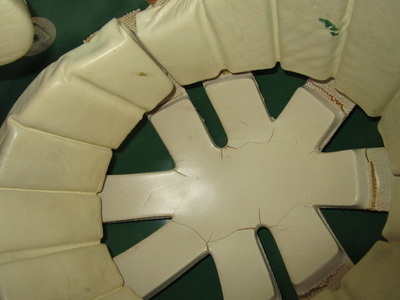 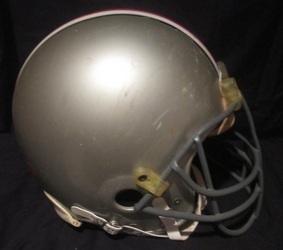 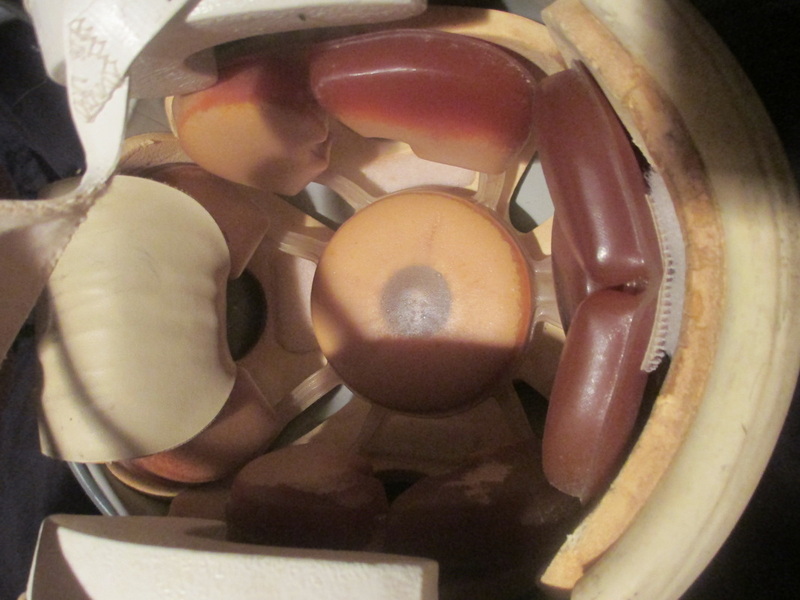 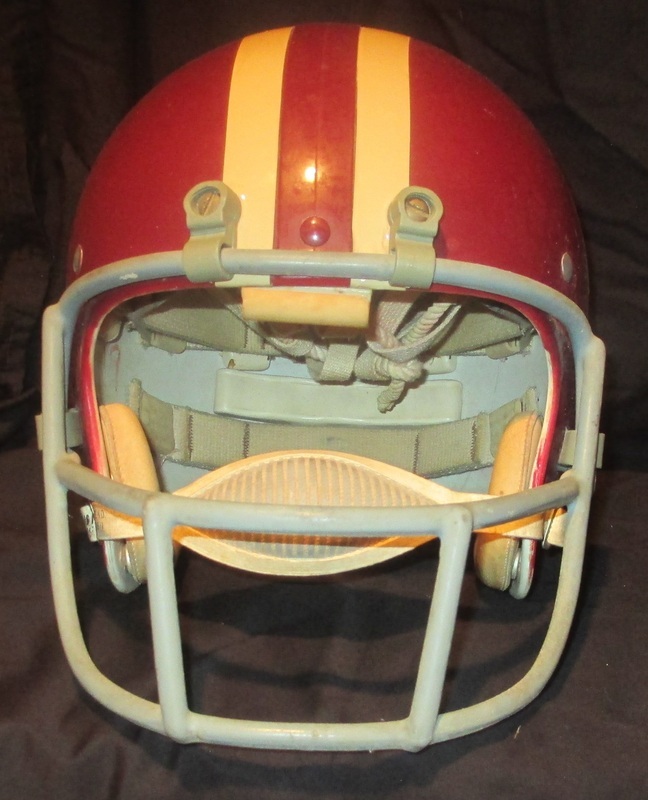 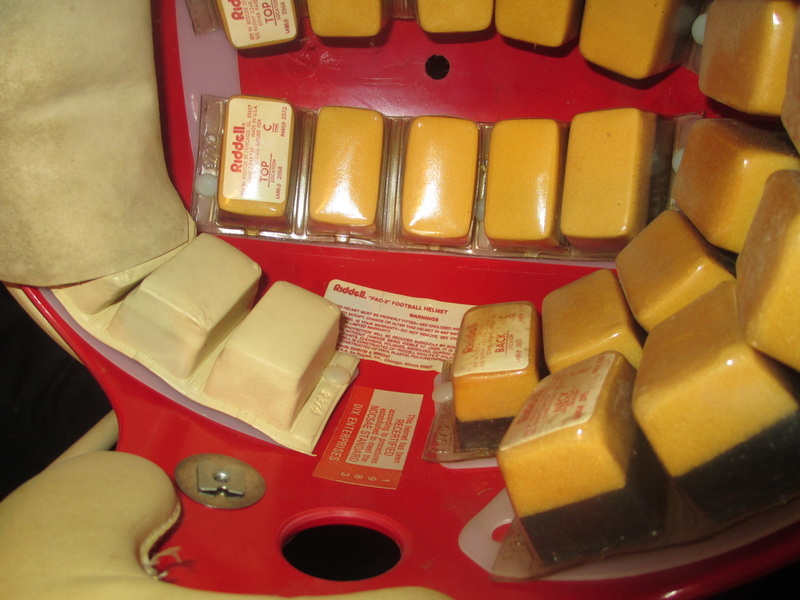 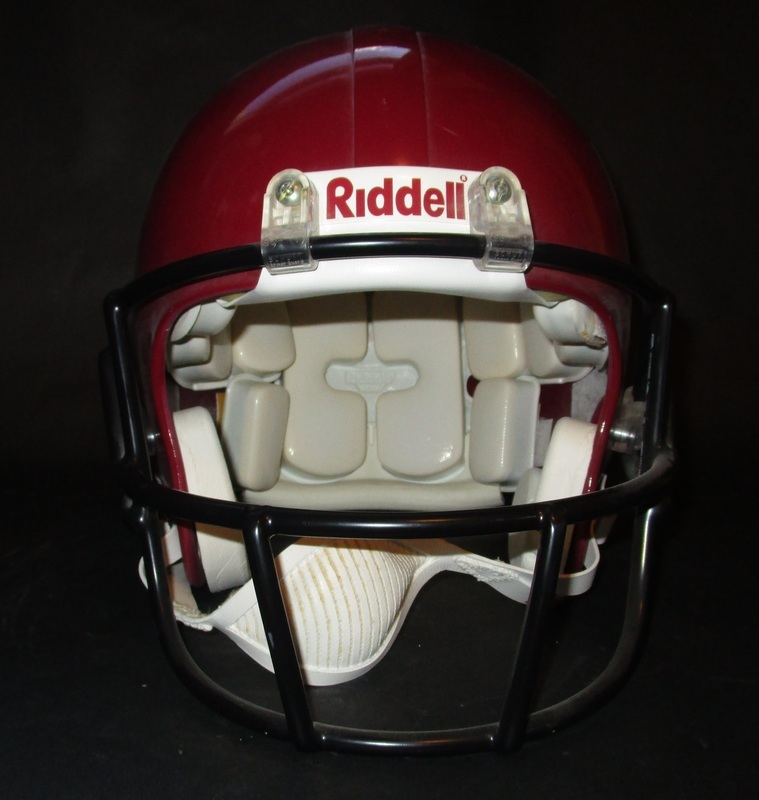 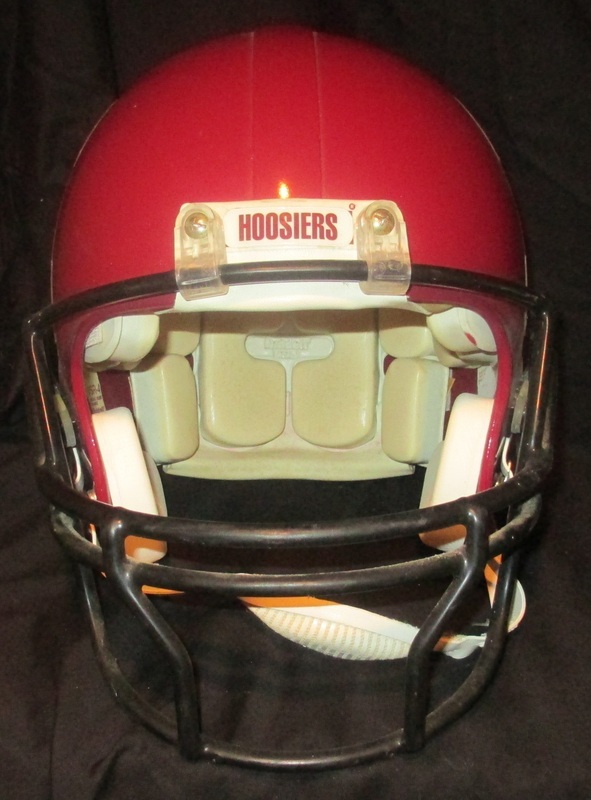 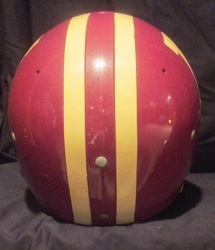 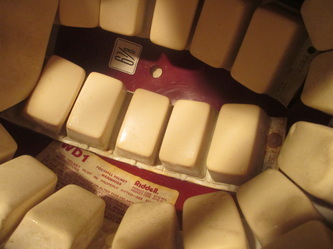 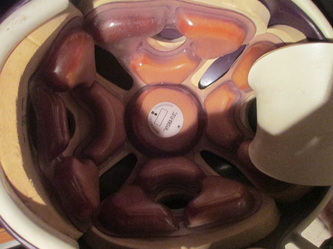 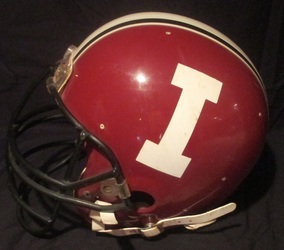 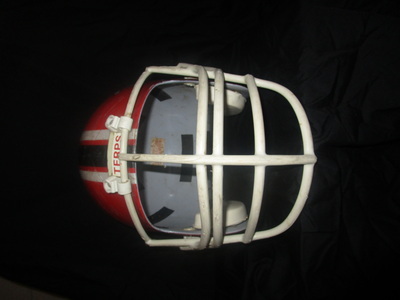 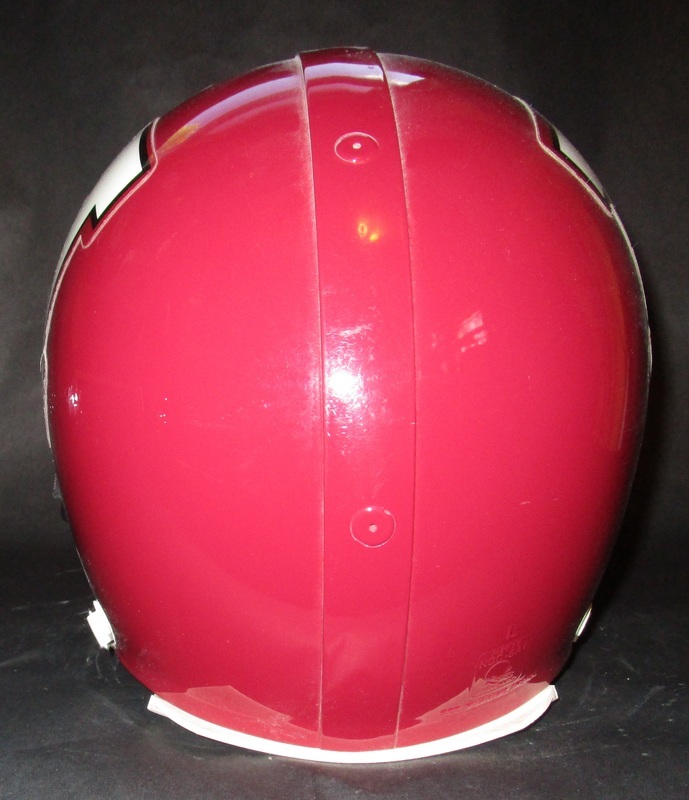 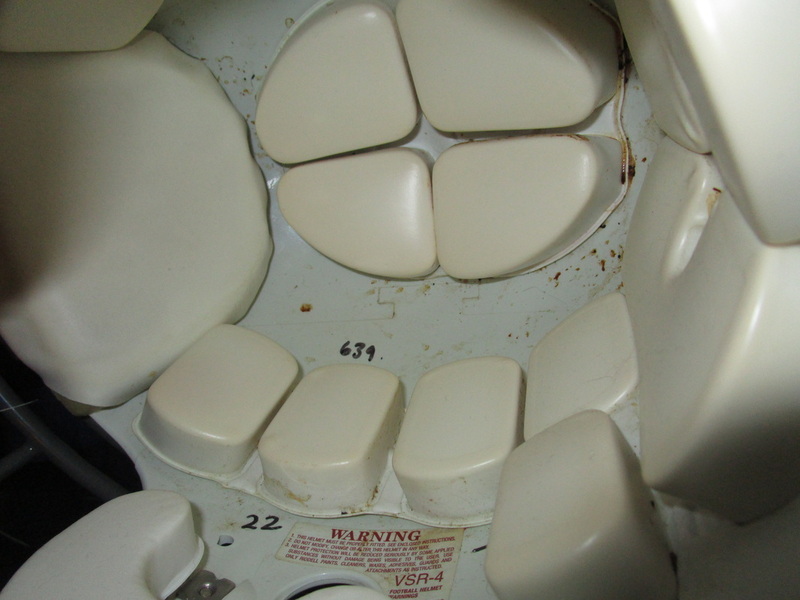 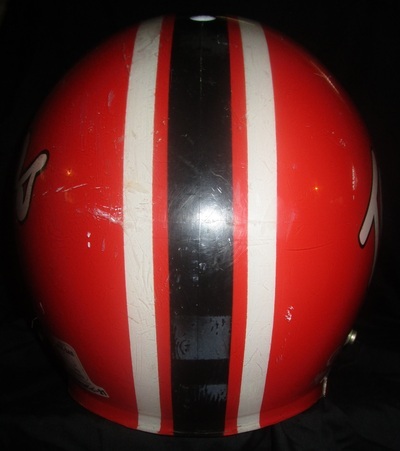 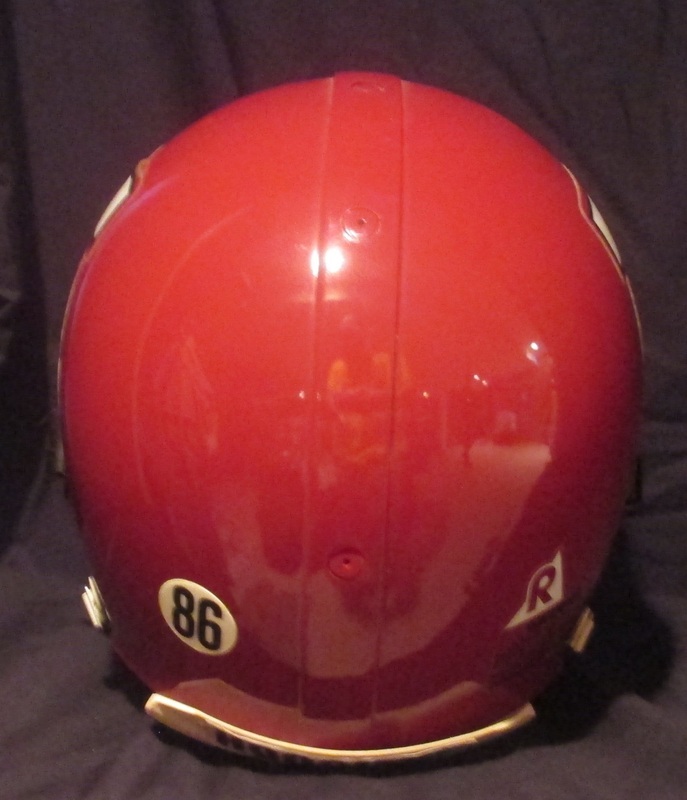 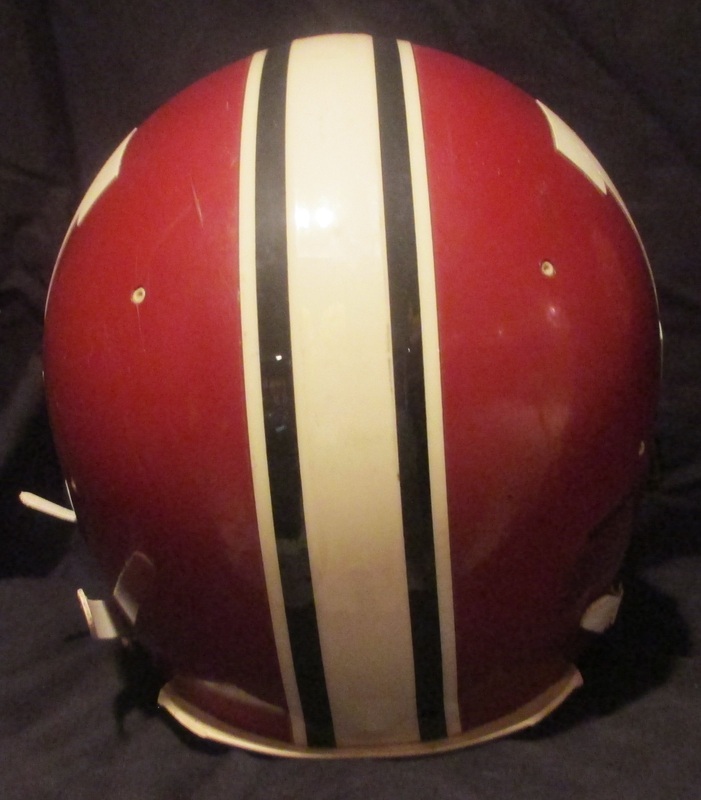 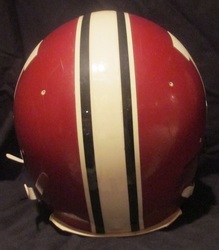 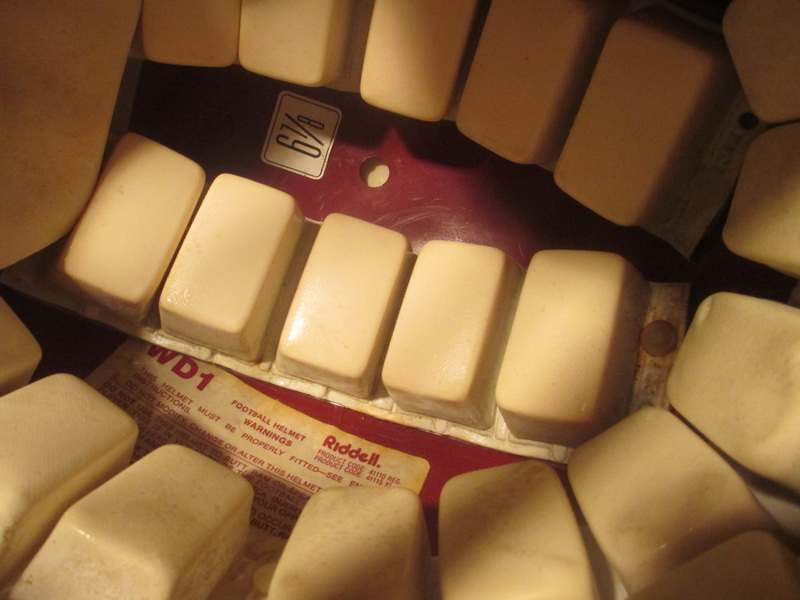 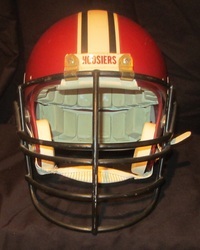 Indiana Hoosiers 1967 Riddell TK2 model suspension helmet. 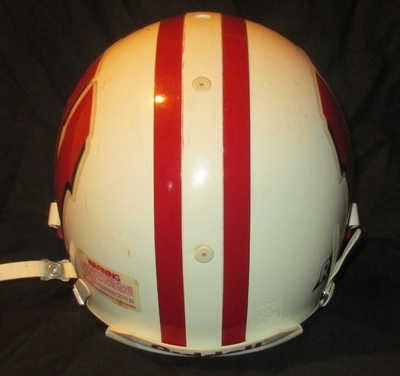 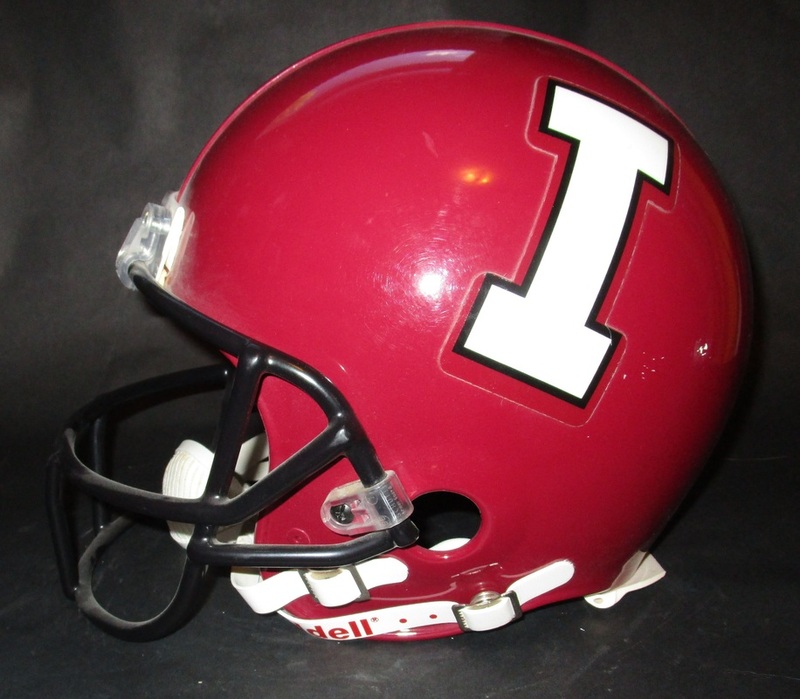 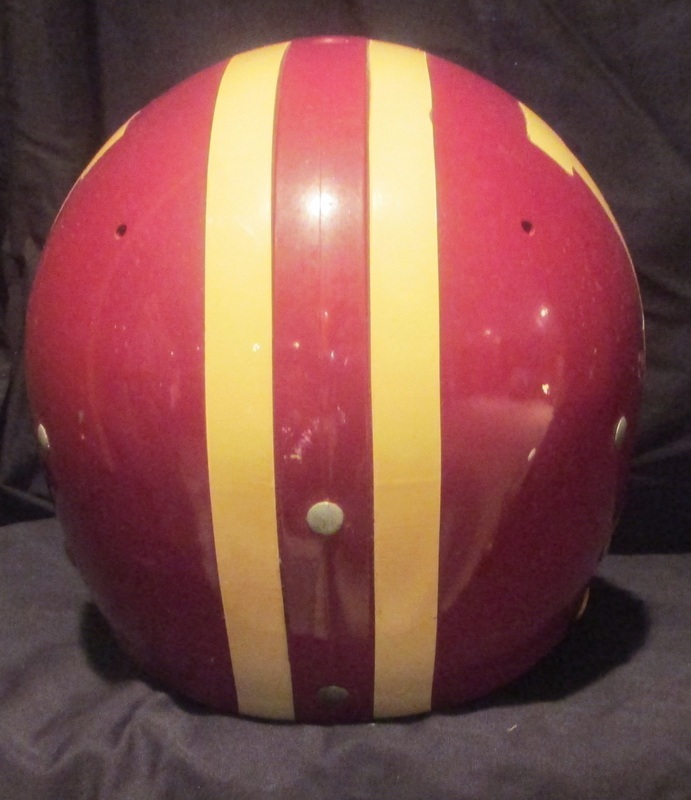 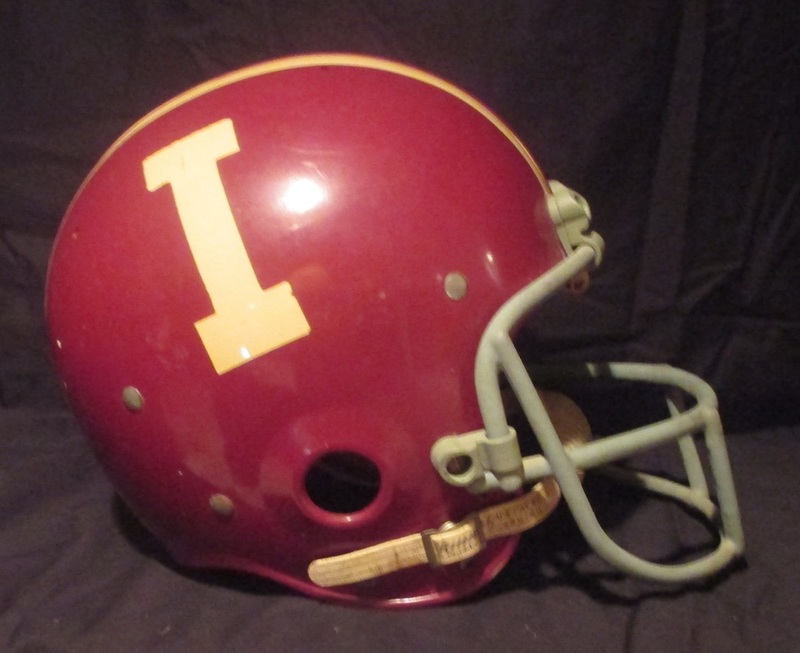 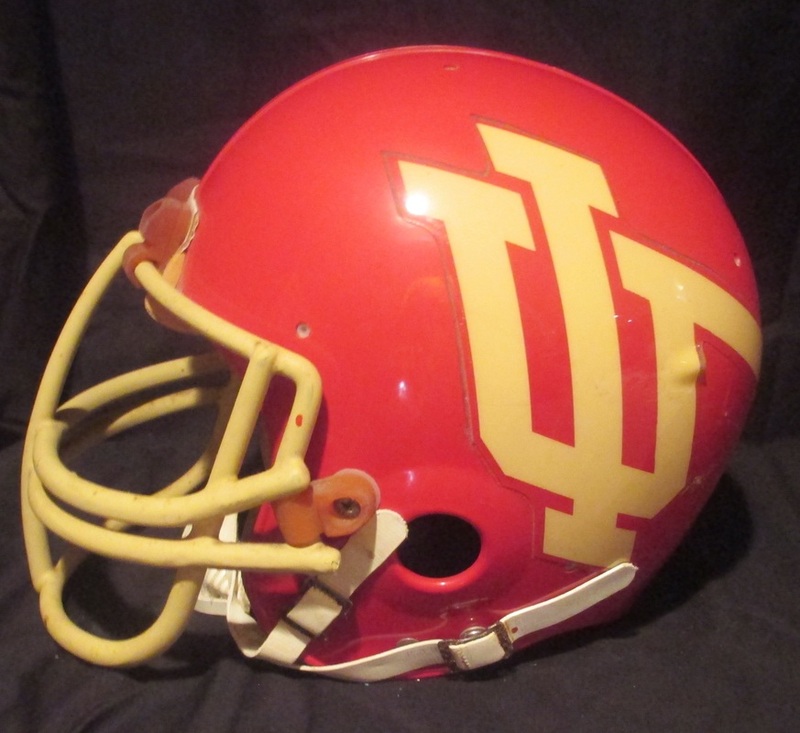 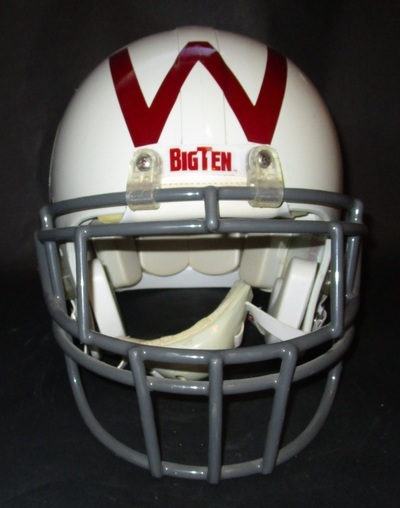 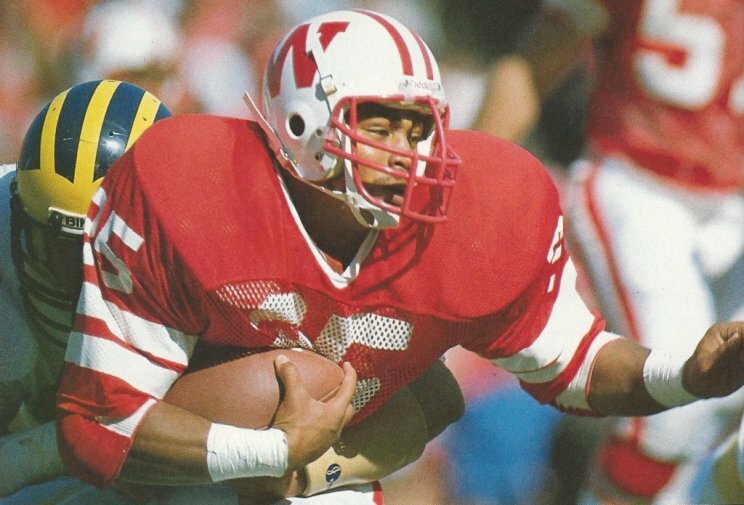 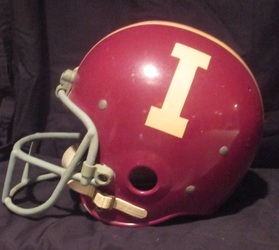 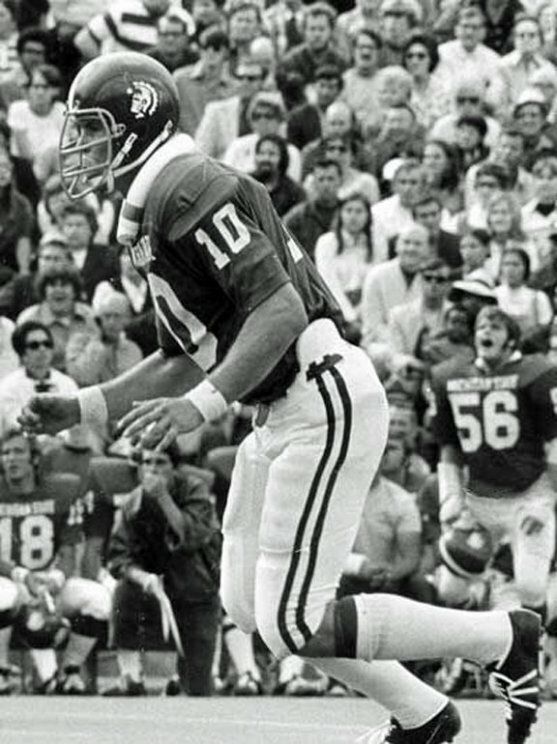 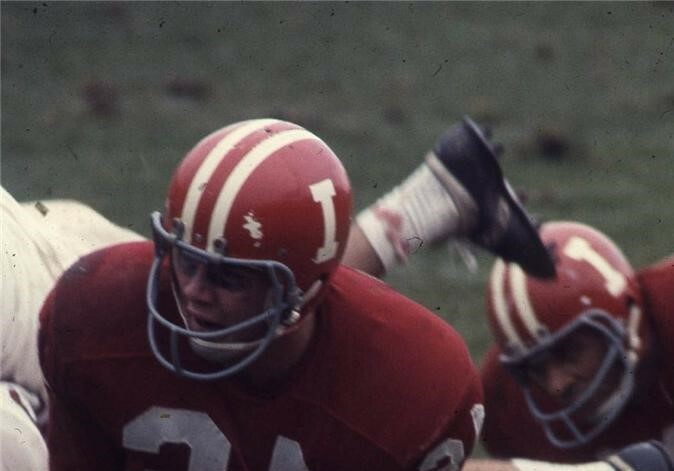 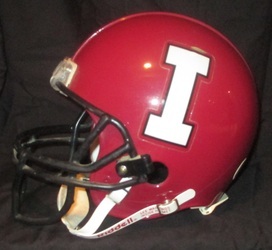 Indiana last won a share of the Big Ten (with Minnesota) in 1967 wearing this helmet. 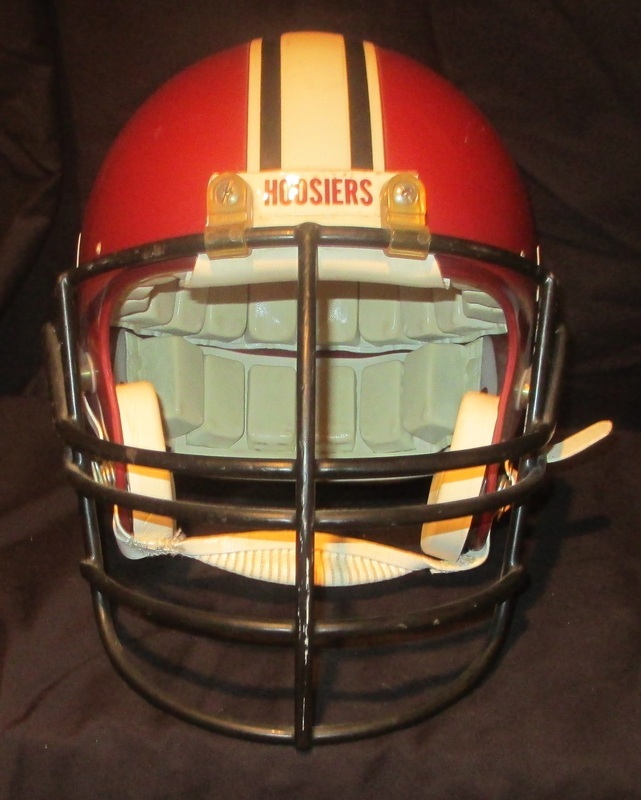 Indiana Hoosiers 1983 PAC3 Riddell model helmet w/ 83 recon sticker. This rare helmet is one of the very few we know to exist and was only worn during the 83 season. 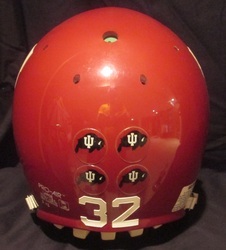 Indiana Hoosiers mid 1990's Air model helmet, #32 with 4 award stickers. 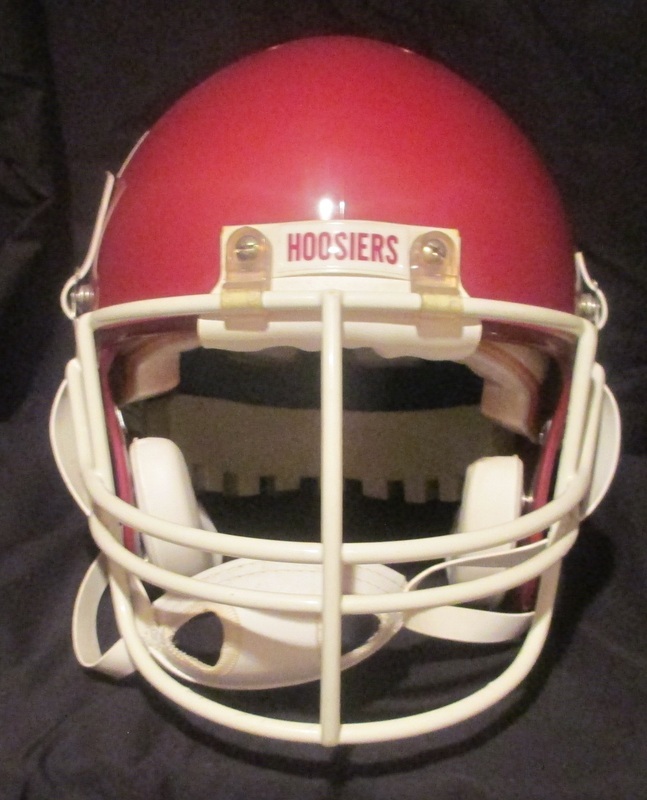 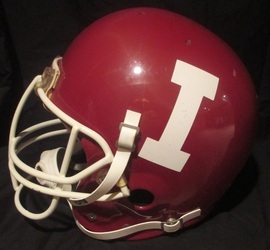 Indiana Hoosiers early 1990s Riddell WD1 model helmet. 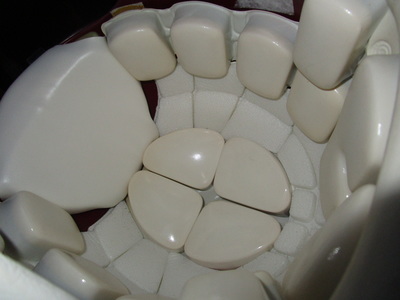 Indiana Hoosiers1996 Riddell VSR4 model helmet. 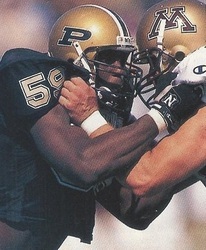 This style was only worn during the 96 season. 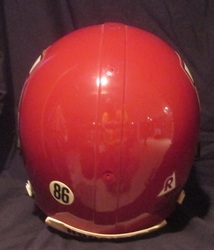 #86 memorial decal on back. 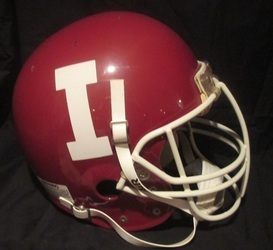 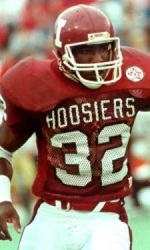 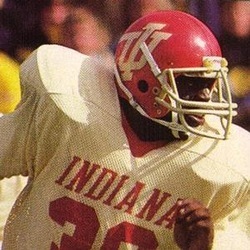 Indiana Hoosiers 1986 Riddell VSR4 helmet. 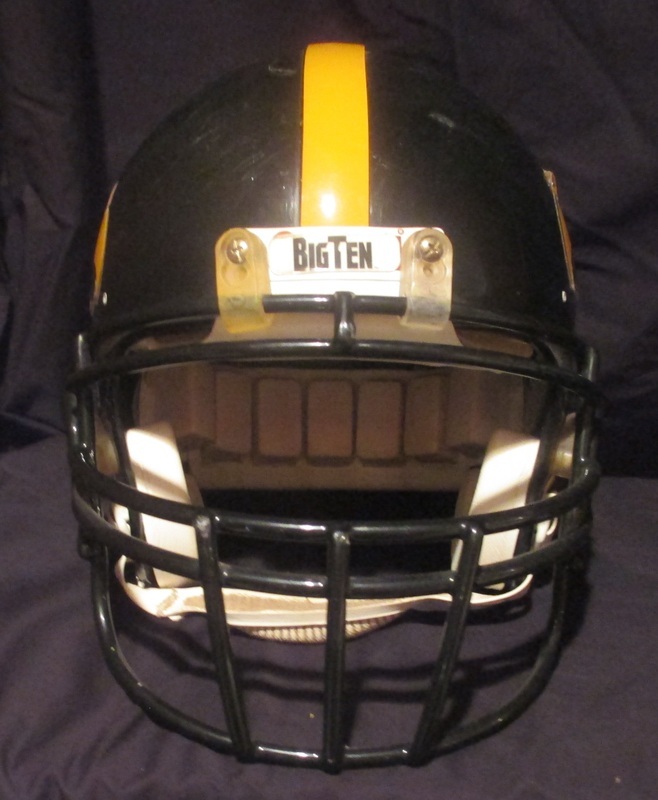 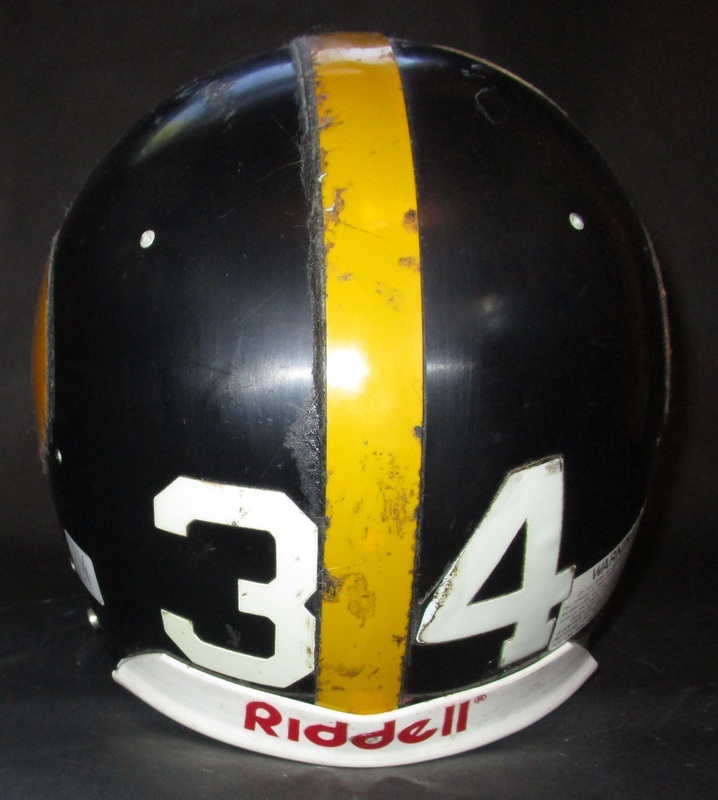 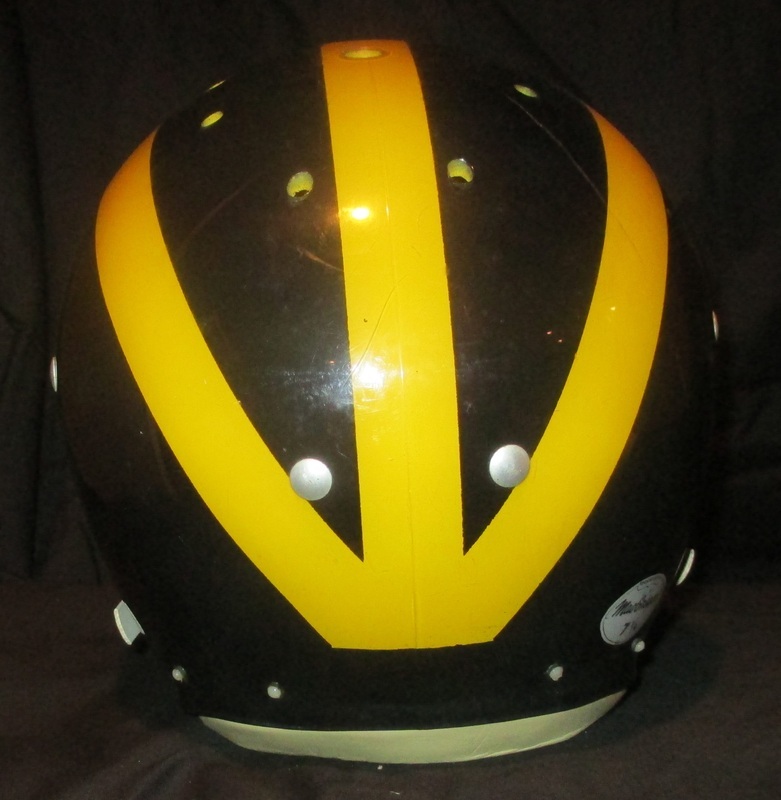 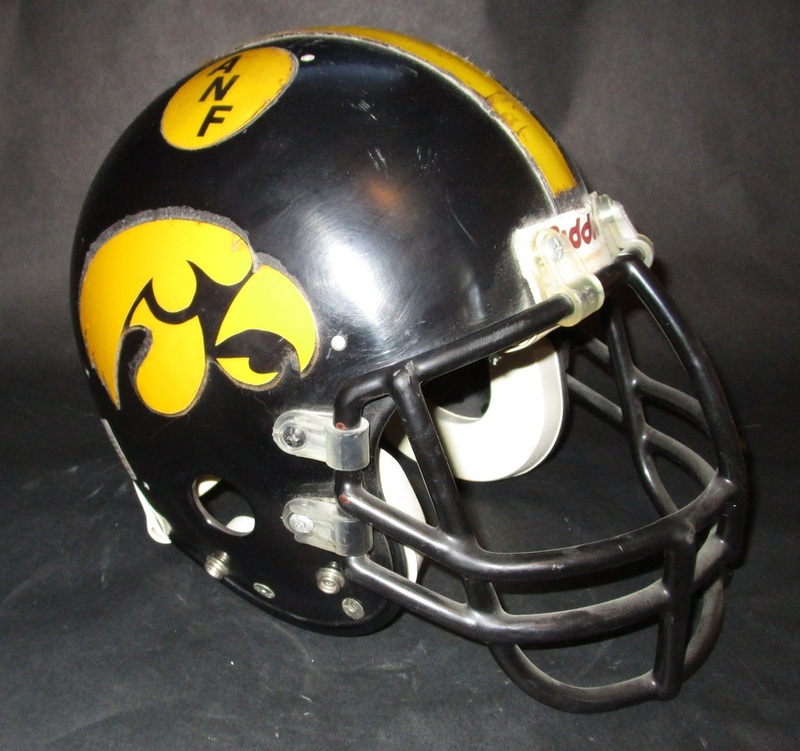 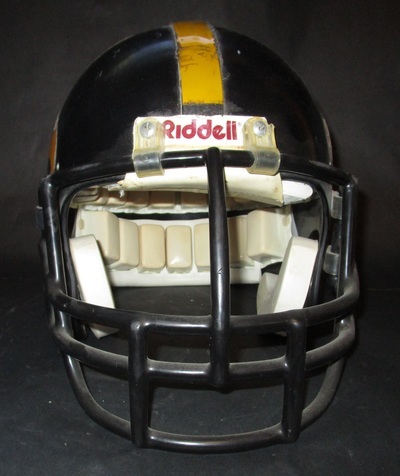 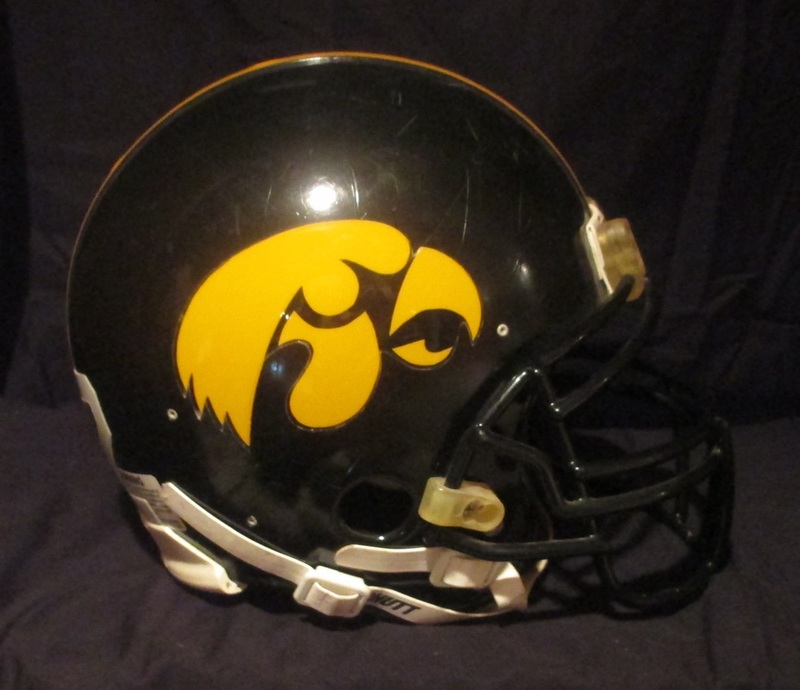 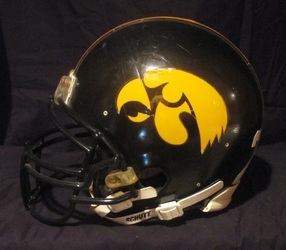 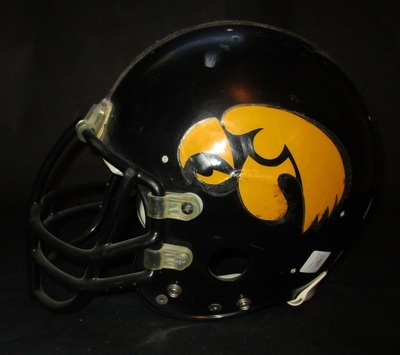 Iowa Hawkeyes mid to late 1980s Riddell WD1 model helmet, #34. 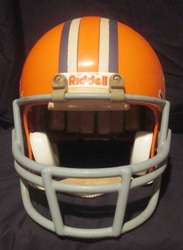 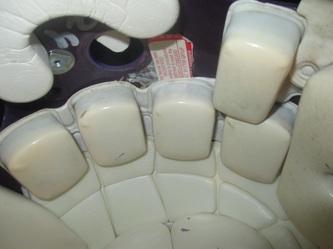 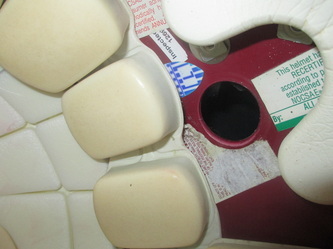 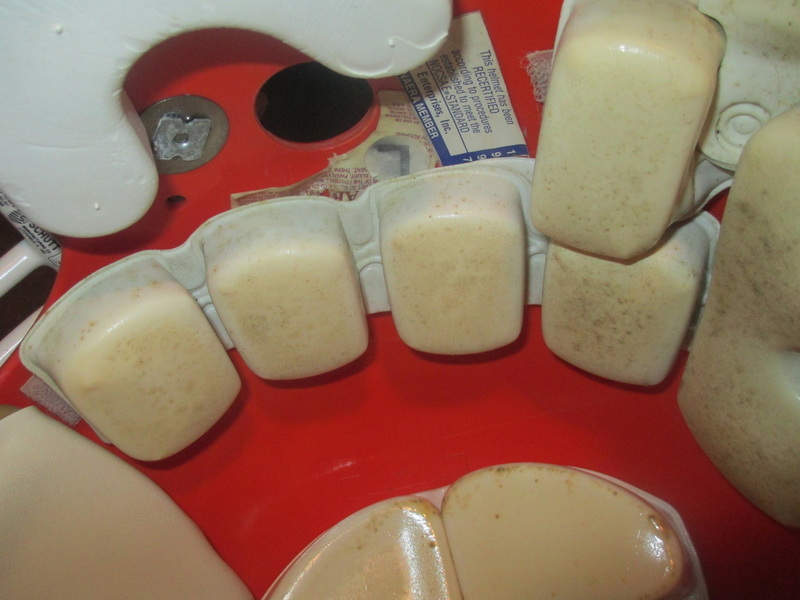 1997 Tavian Banks Riddell with 1997 recon sticker and the name Banks etched in the side. This one came straight out of the Iowa equipment room. 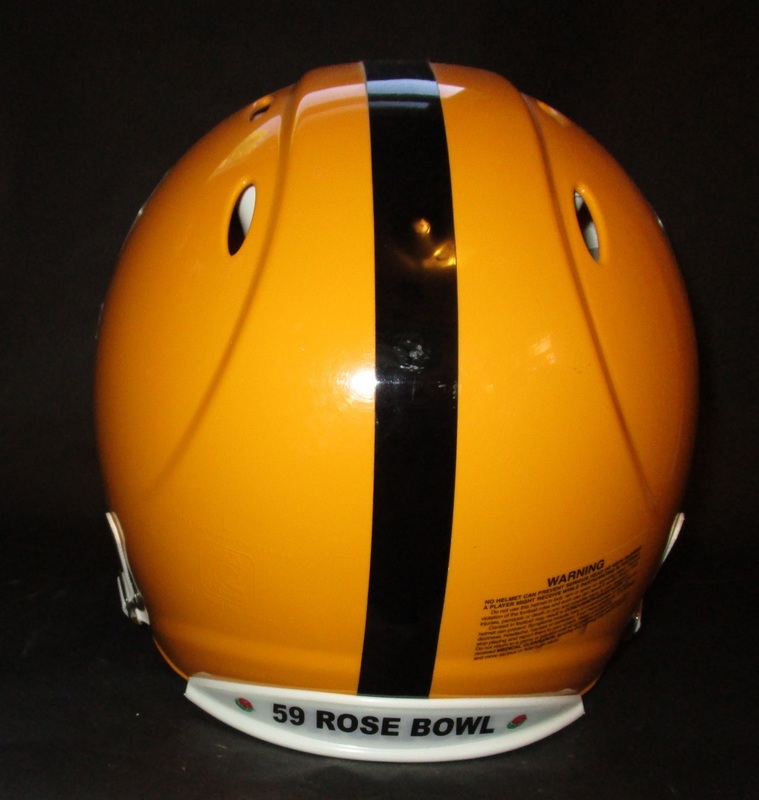 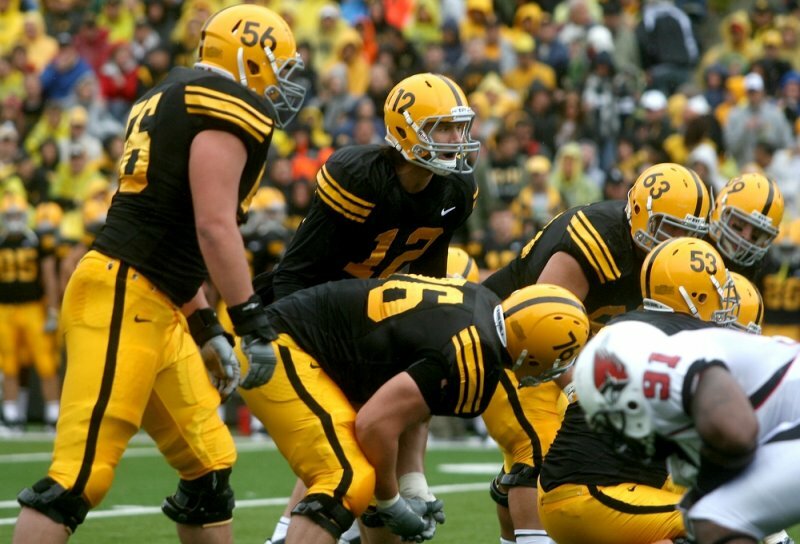 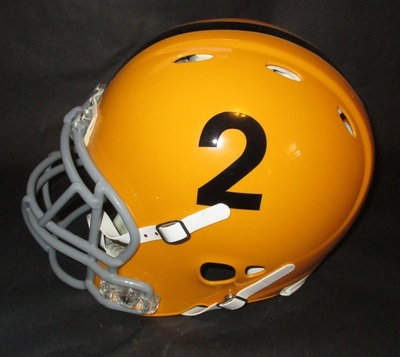 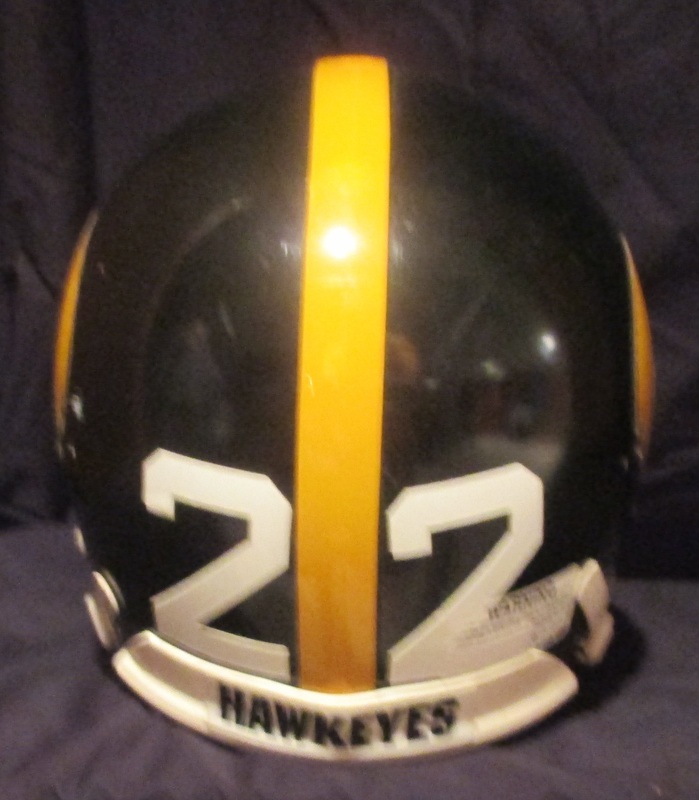 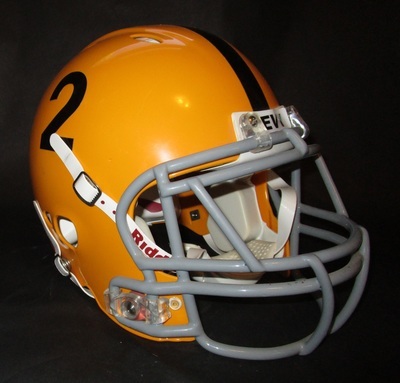 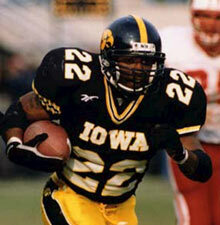 Iowa Hawkeyes 1959 Rose Bowl throwback helmet worn against Ball State in 2010, worn by WR James Hurt, #2. 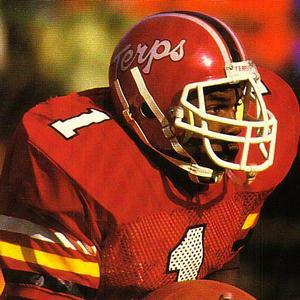 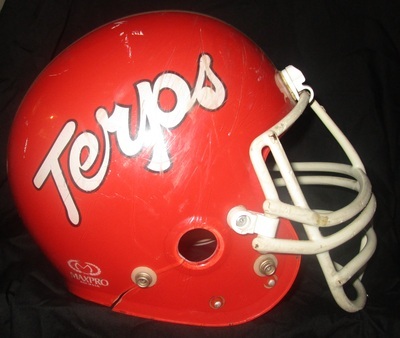 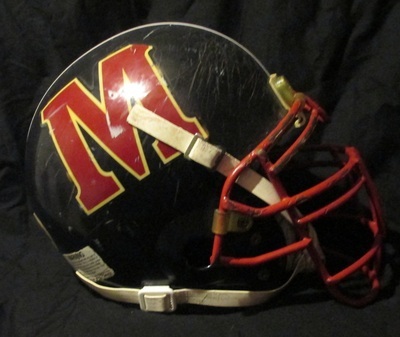 Maryland Terrapins early 1980's Maxpro clear shell helmet. No longer in collection. 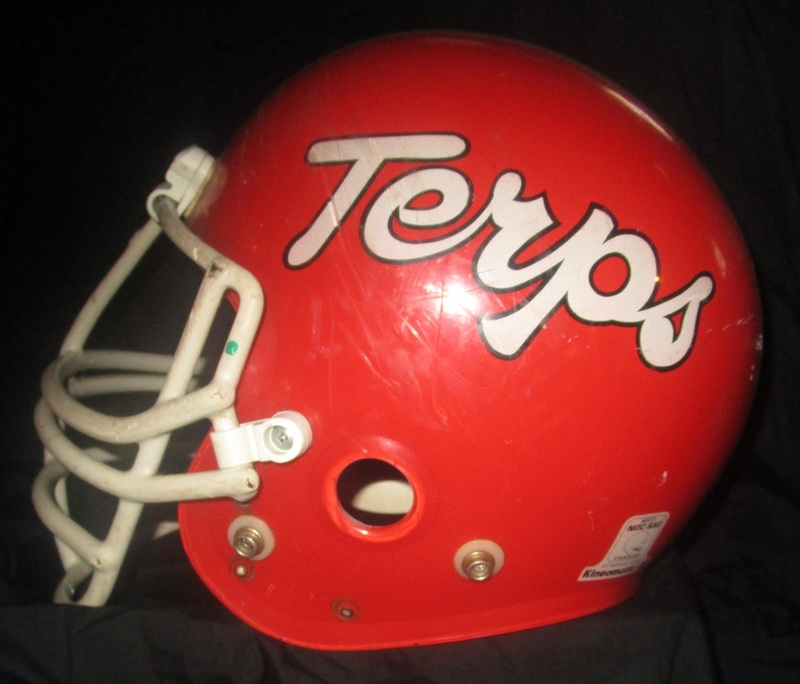 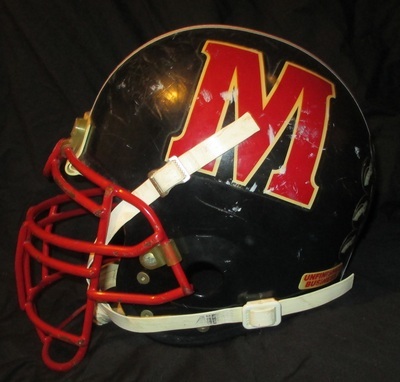 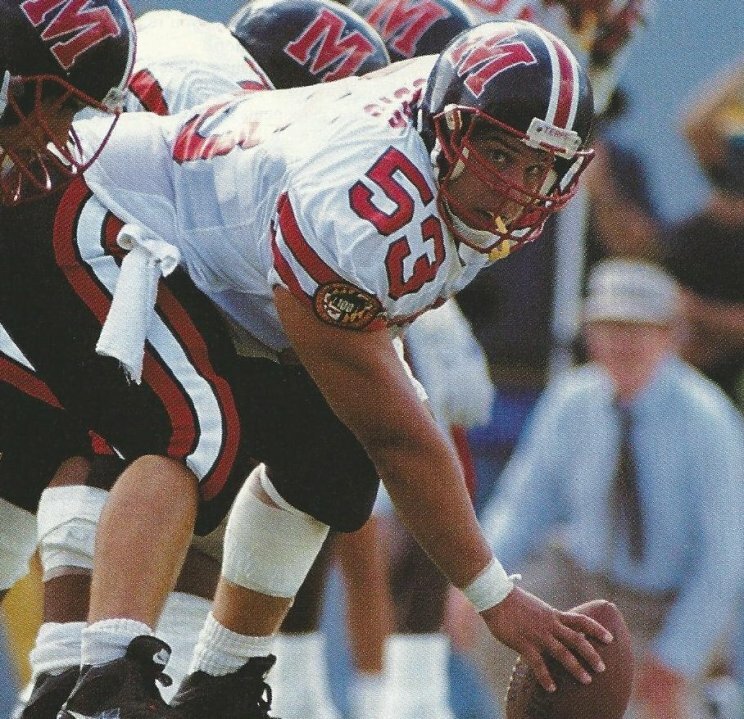 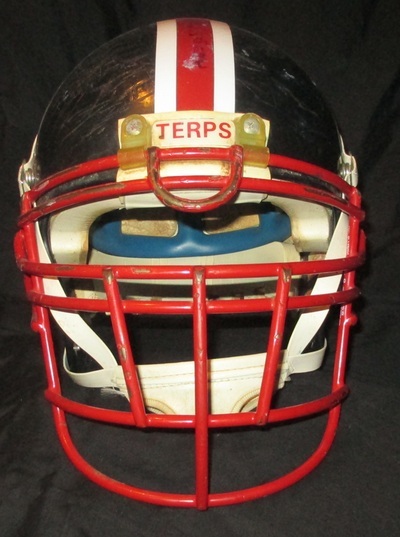 Maryland Terrapins helmet from the mid 1990's. 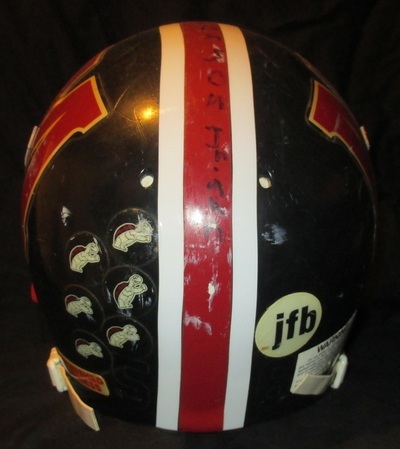 JFB and Unfinished Business decals on back, along with 6 Terrapins decals. 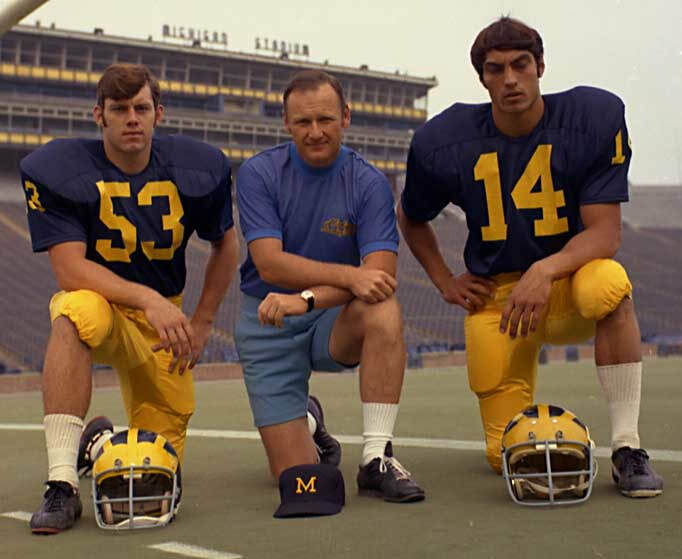 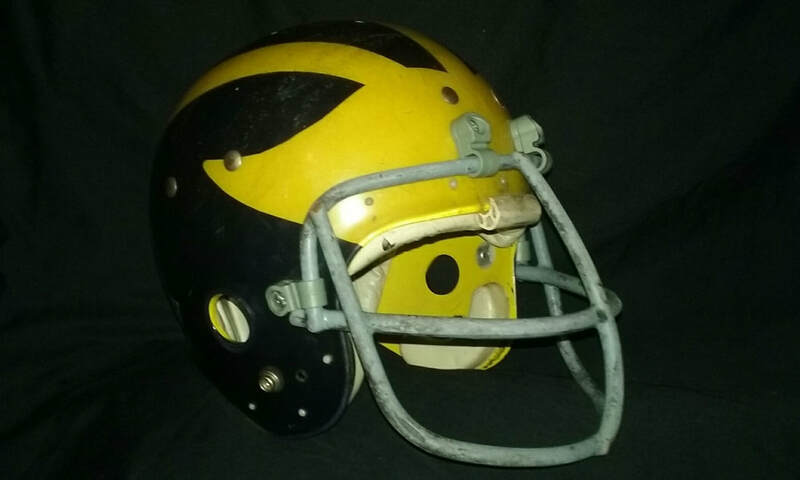 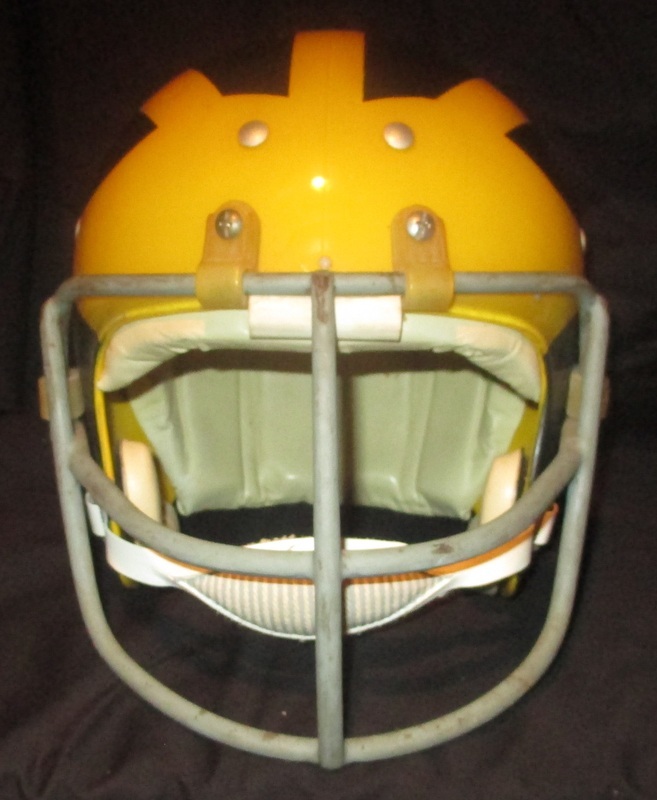 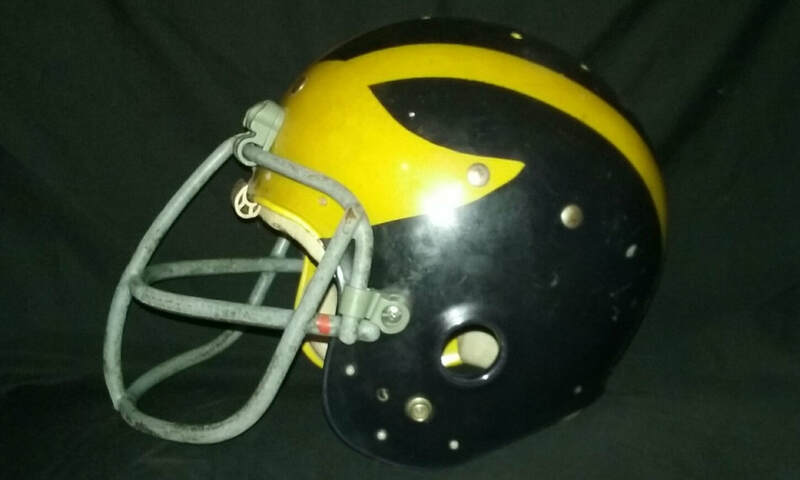 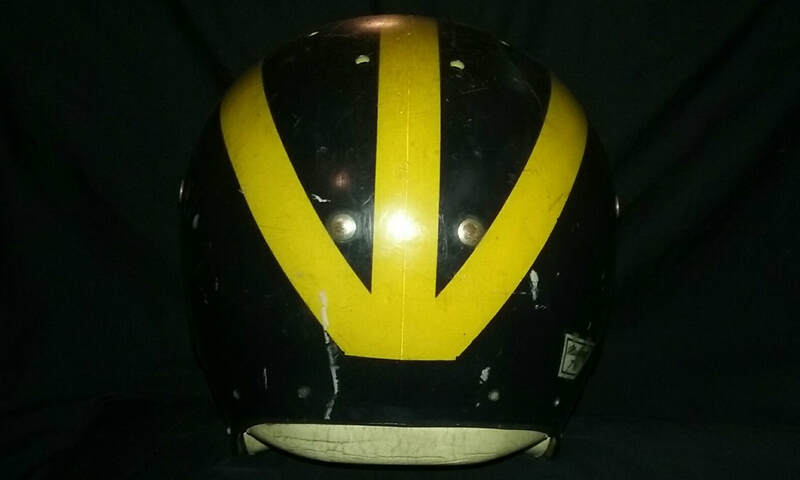 Michigan Wolverines early 1970's MacGregor model clear shell helmet. 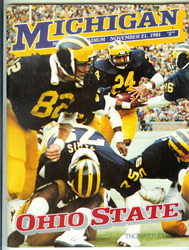 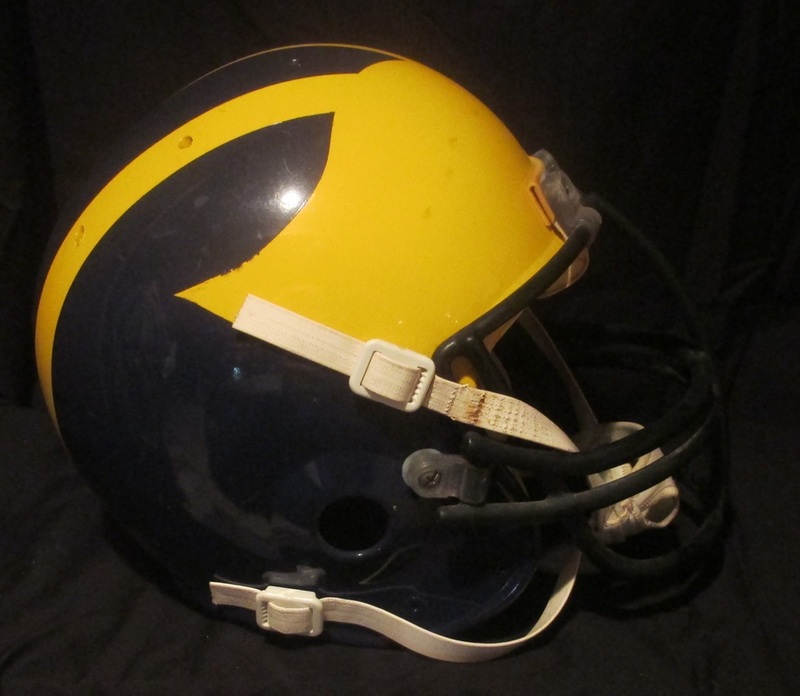 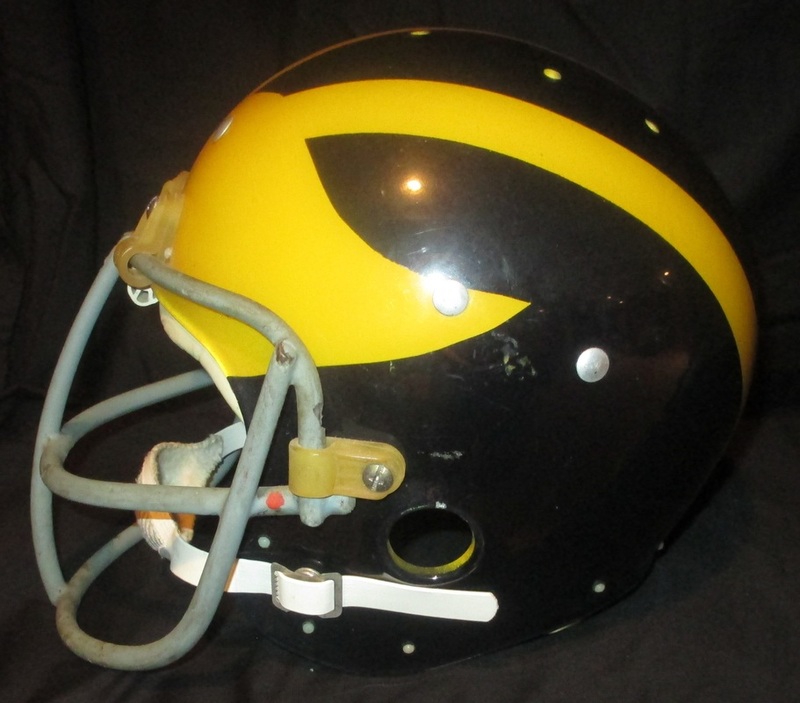 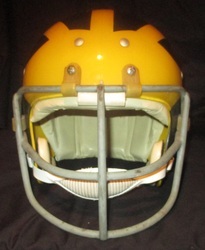 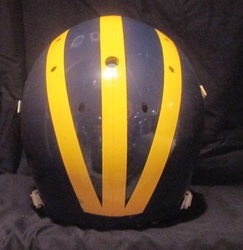 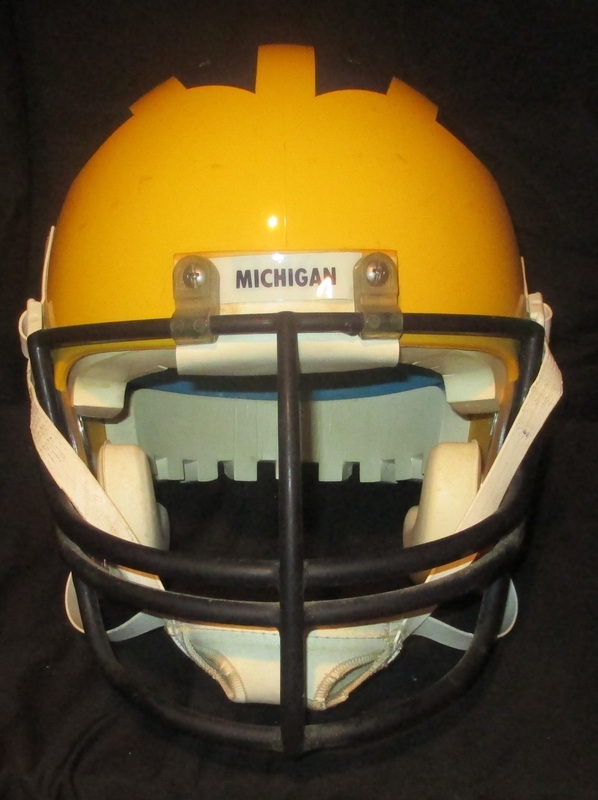 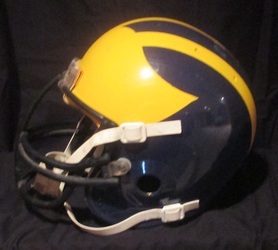 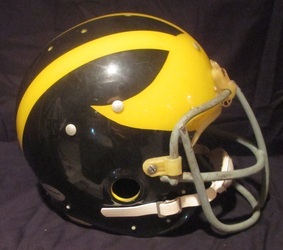 Michigan Wolverines 1970's Macgregor model clear shell helmet. 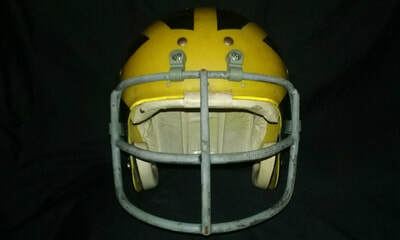 Michigan Wolverines early 1980's Bike model helmet. 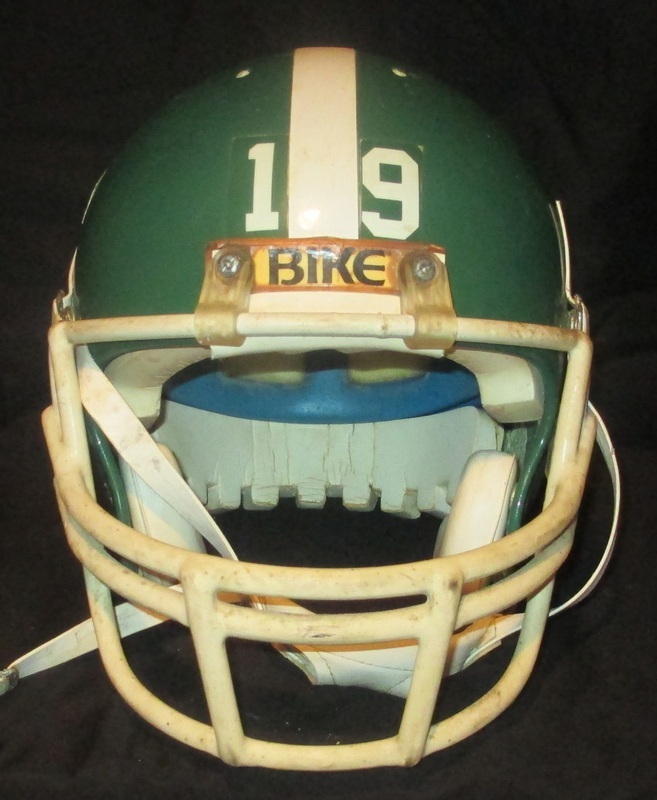 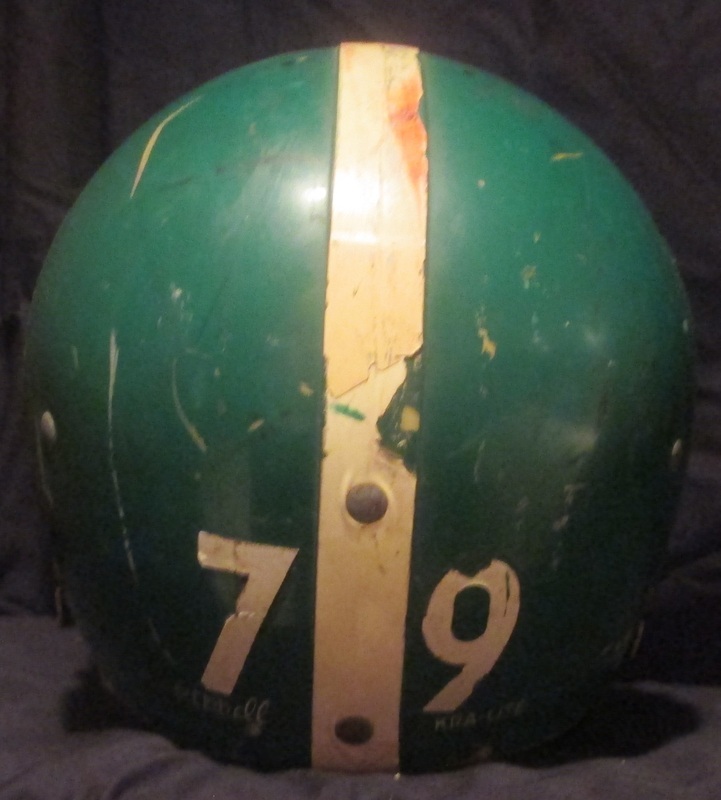 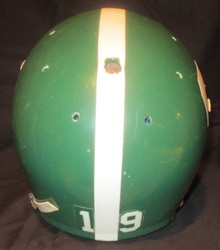 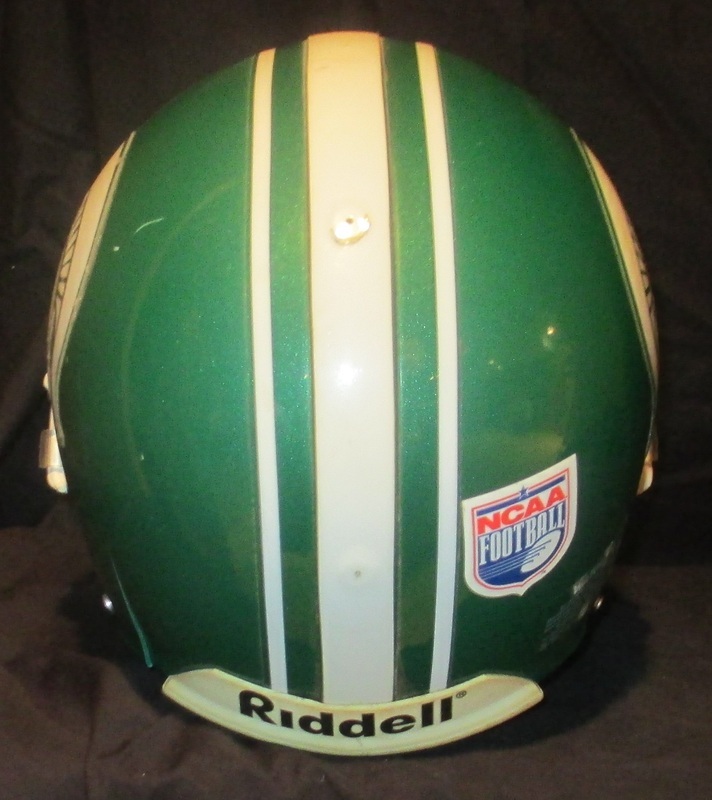 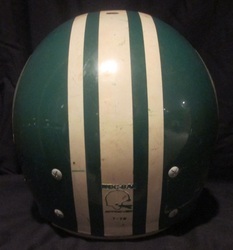 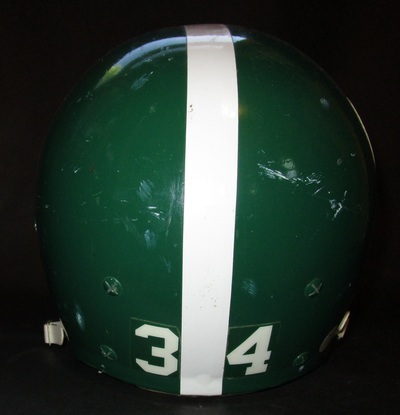 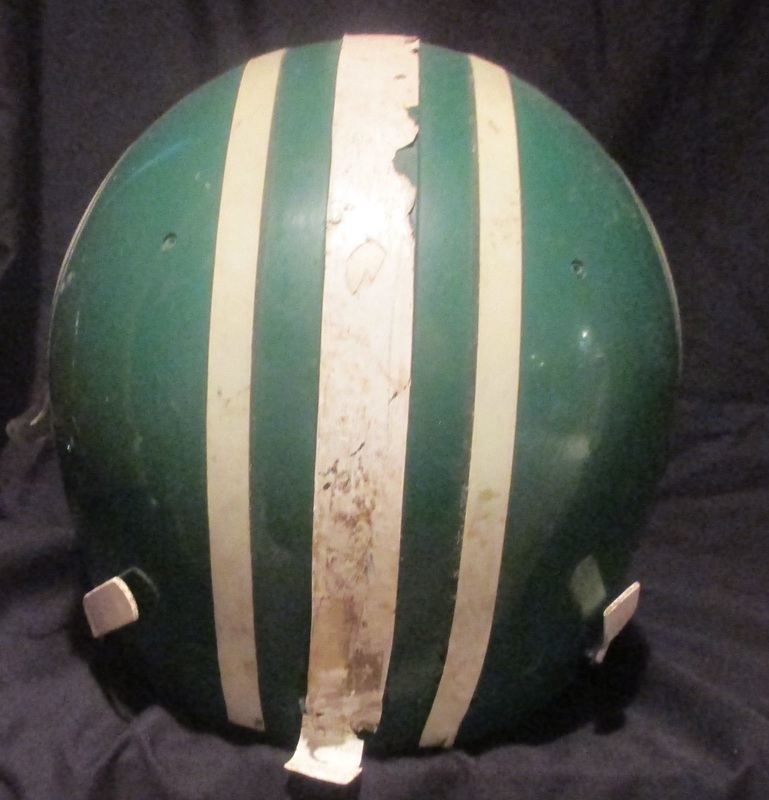 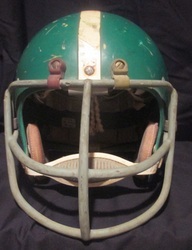 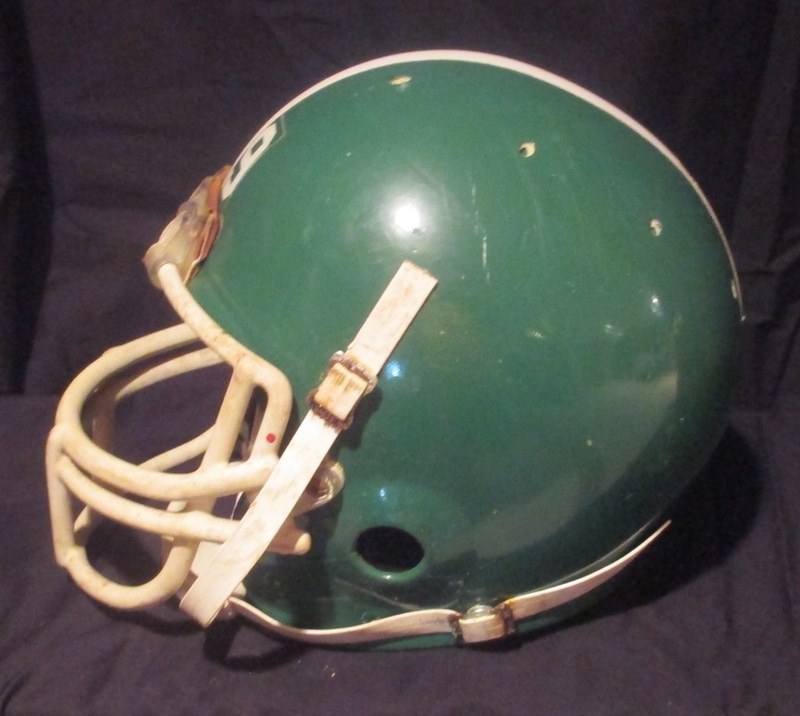 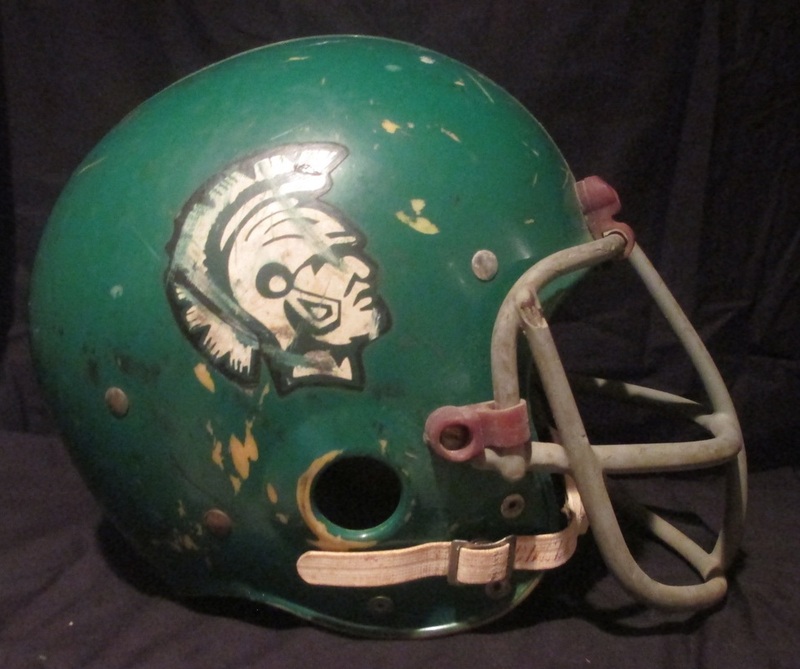 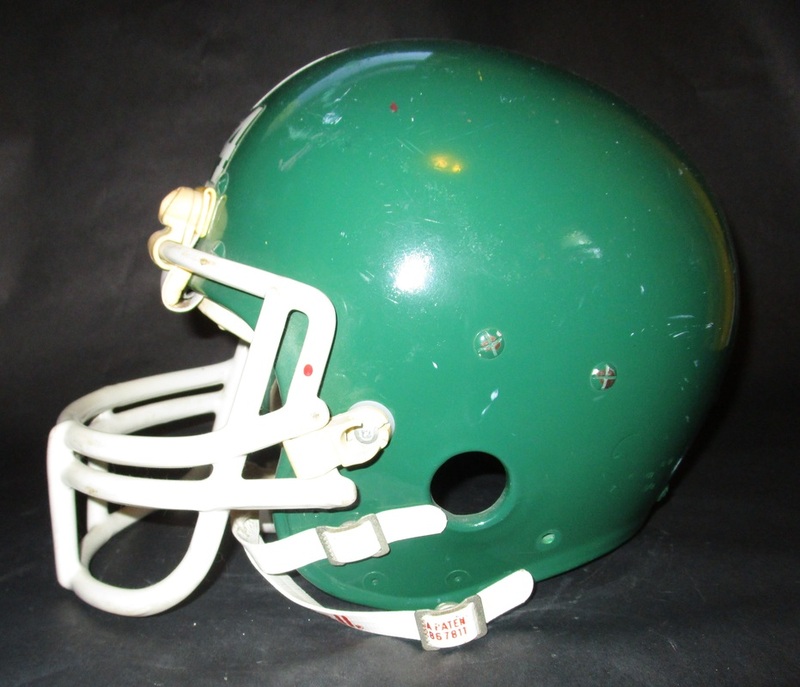 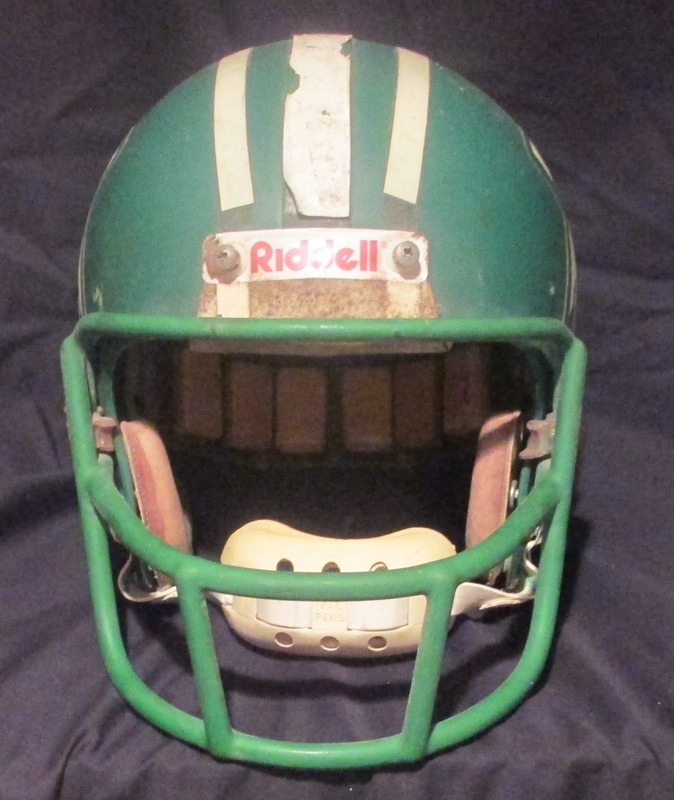 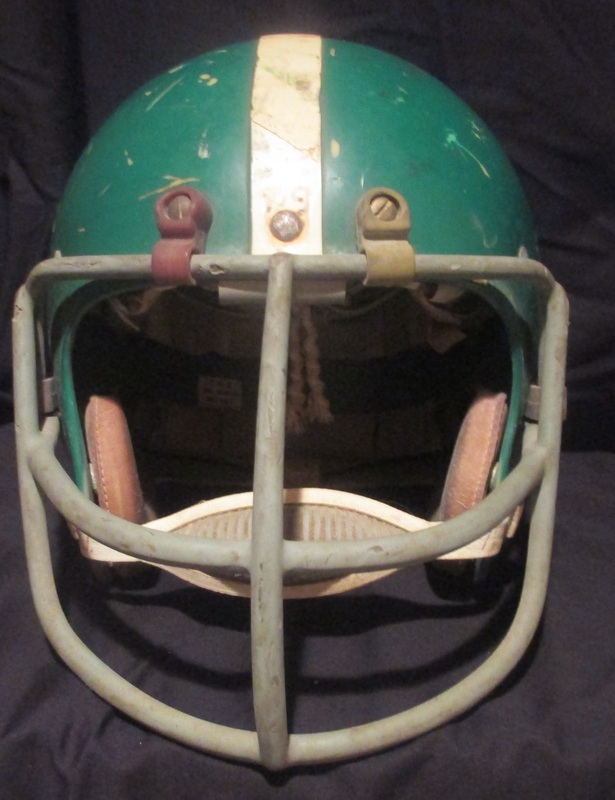 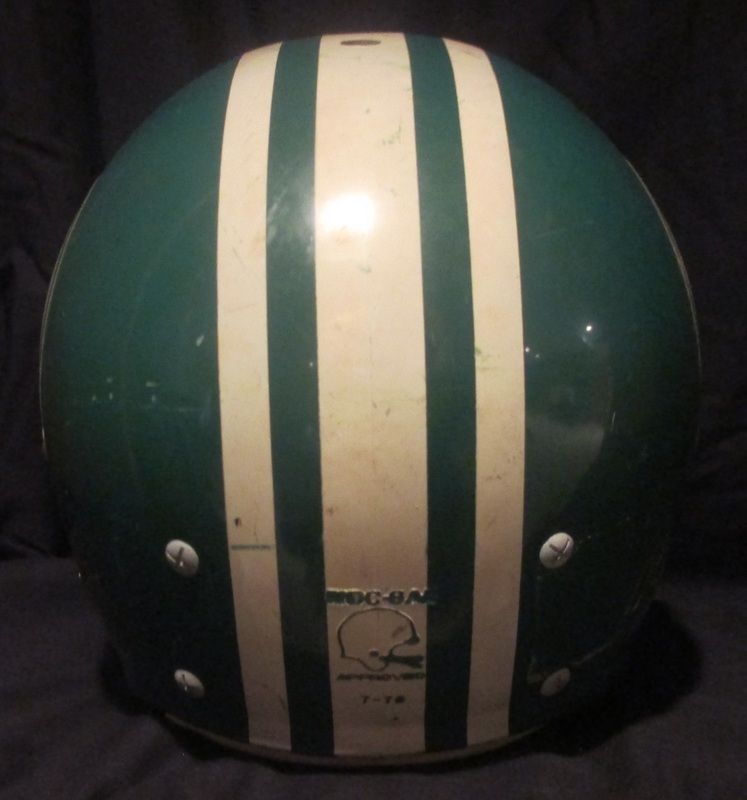 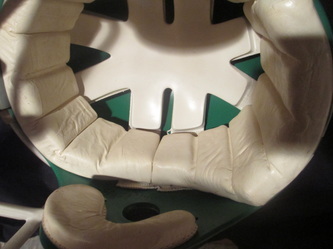 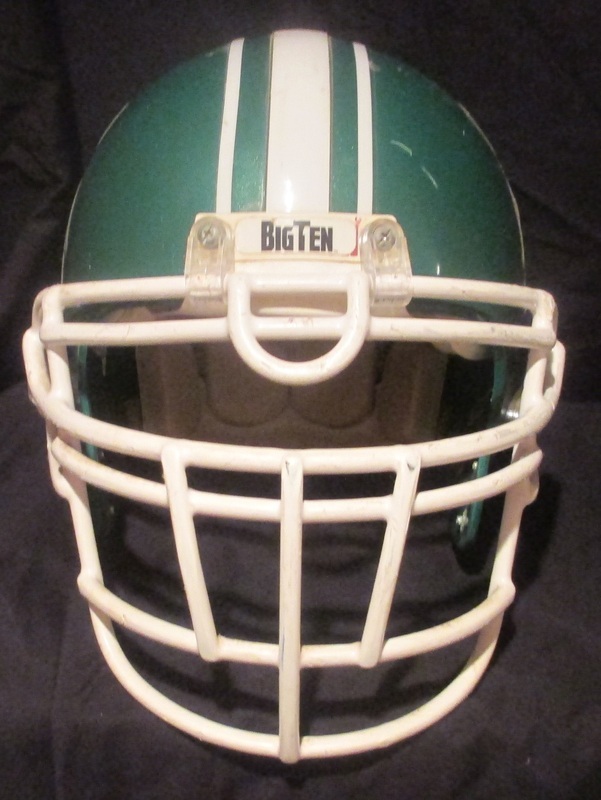 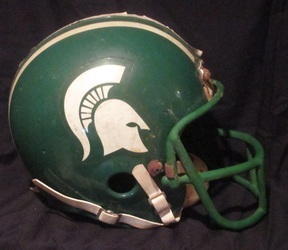 Michigan State Spartans 1967-72 Riddell Kra-lite model suspension helmet, most likely worn by DL Ronald Joseph in 1968-69. 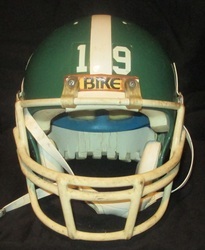 Michigan State Spartans early 80s Bike model with 1984 recon sticker, #19. 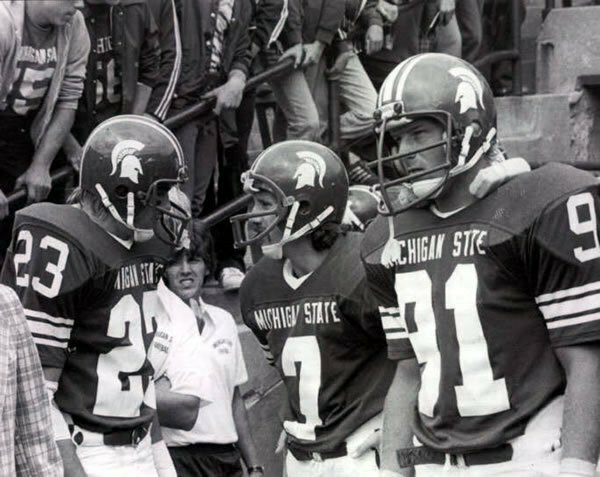 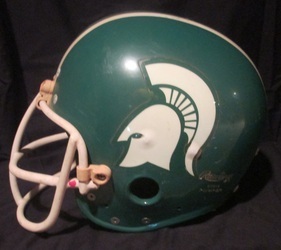 Michigan State Spartans 1978-81 Rawlings model helmet. 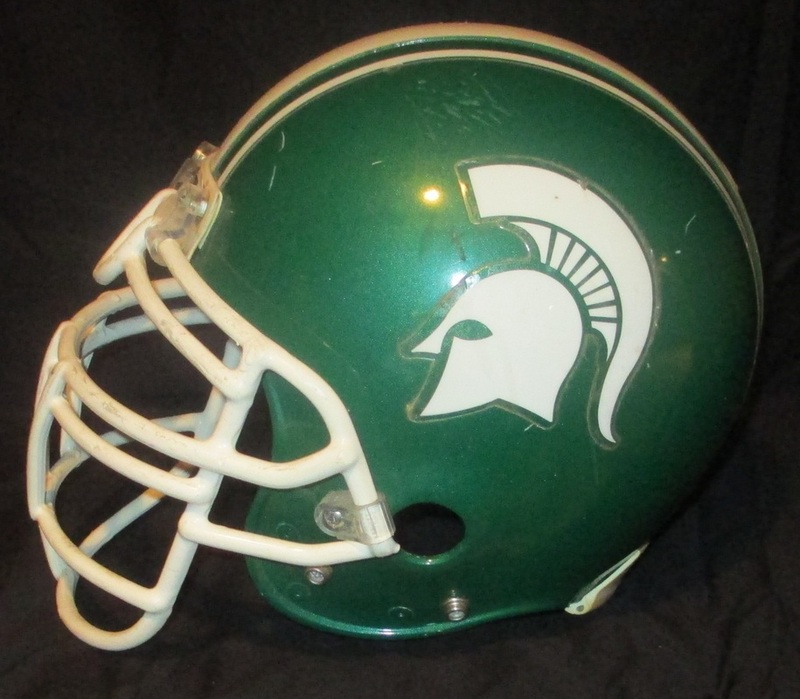 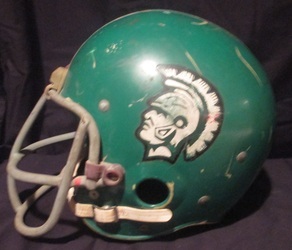 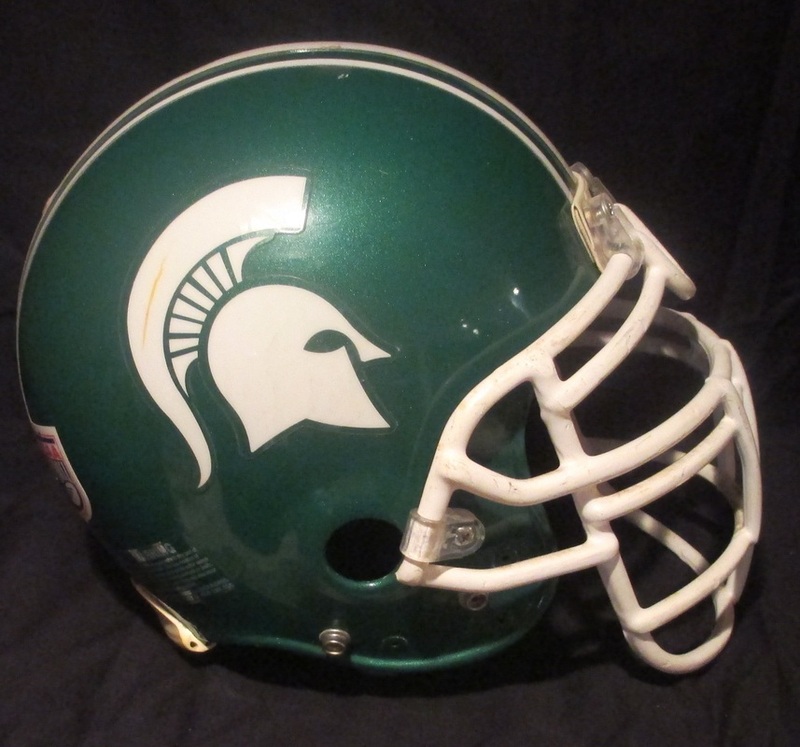 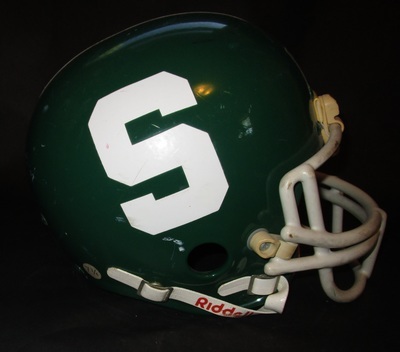 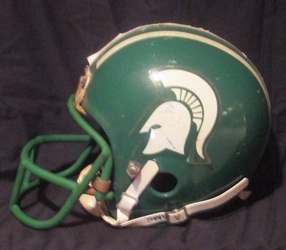 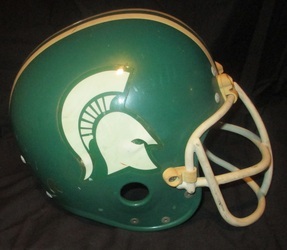 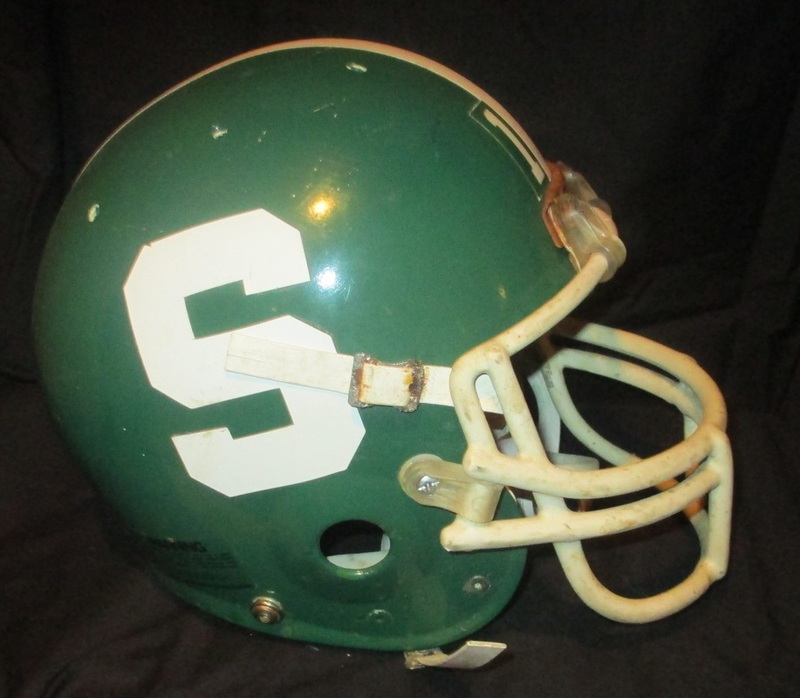 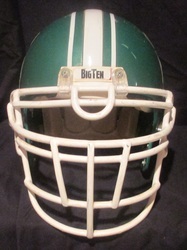 Michigan State Spartans1977 Riddell model helmet. 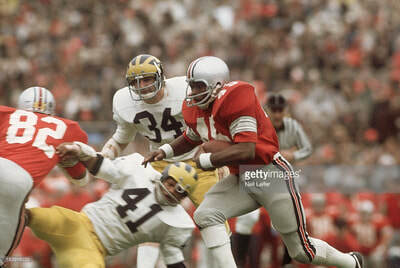 This style was only worn during the 1977 season. 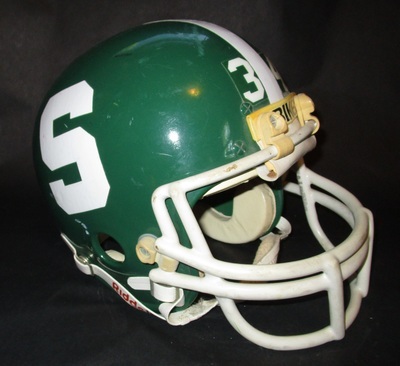 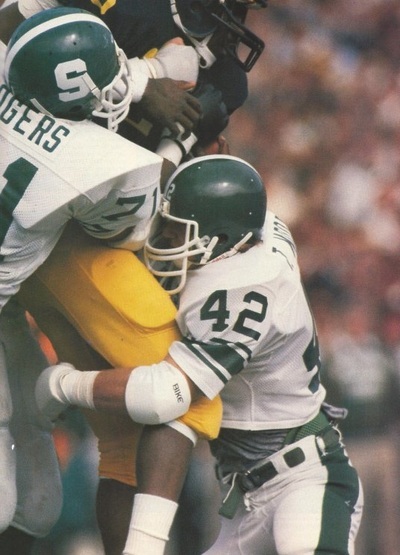 Michigan State Spartans mid 1980s, Rawlings model helmet, #34. Michigan State Spartans 1997 Riddell VSR4 model helmet with the NCAA football decal on back. 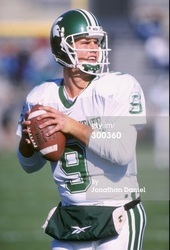 This one came straight out of the Spartans' equipment room after the 97' season. 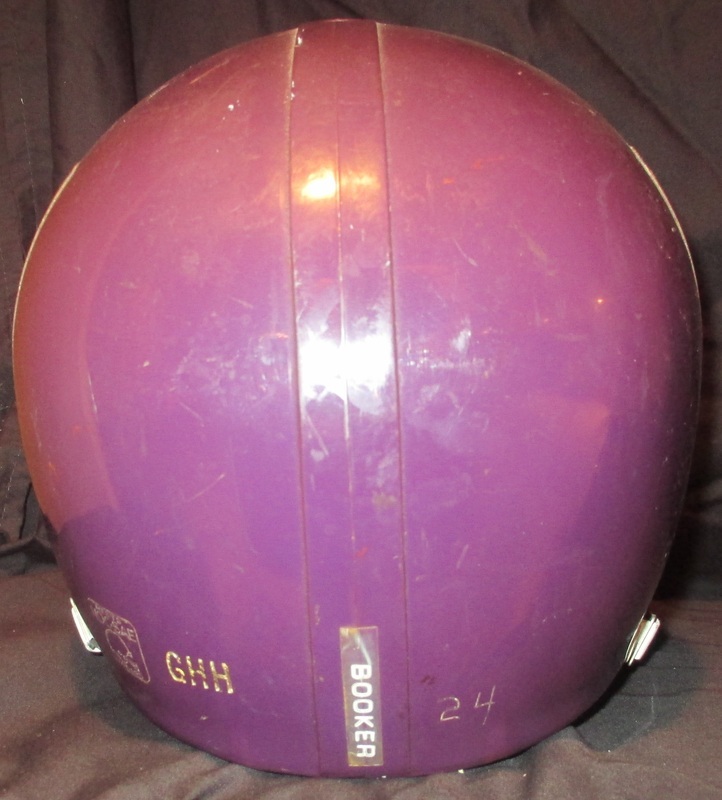 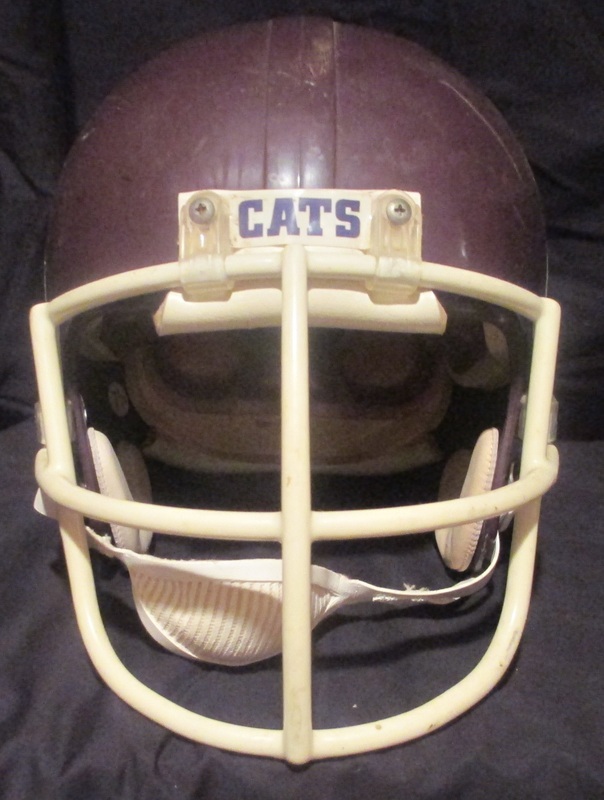 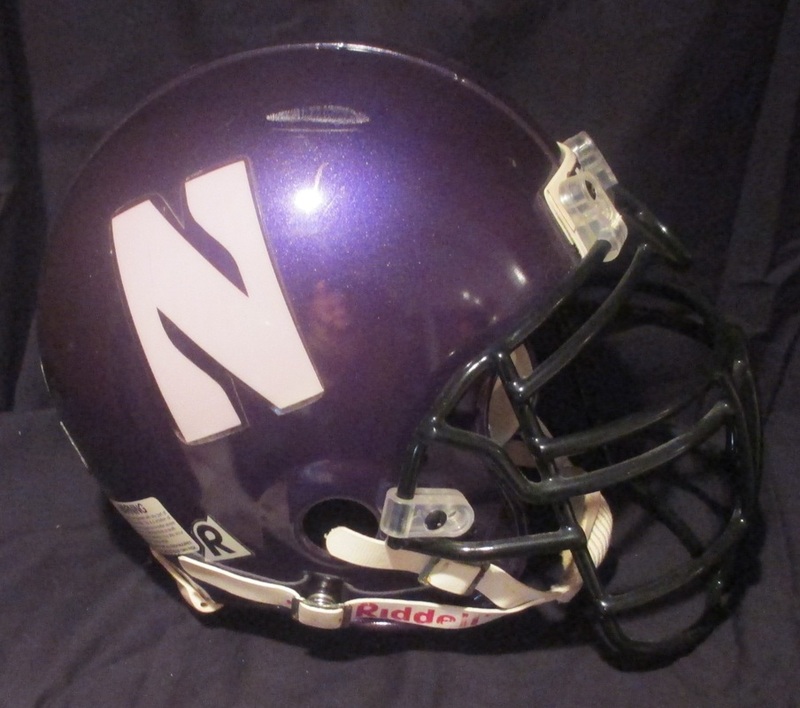 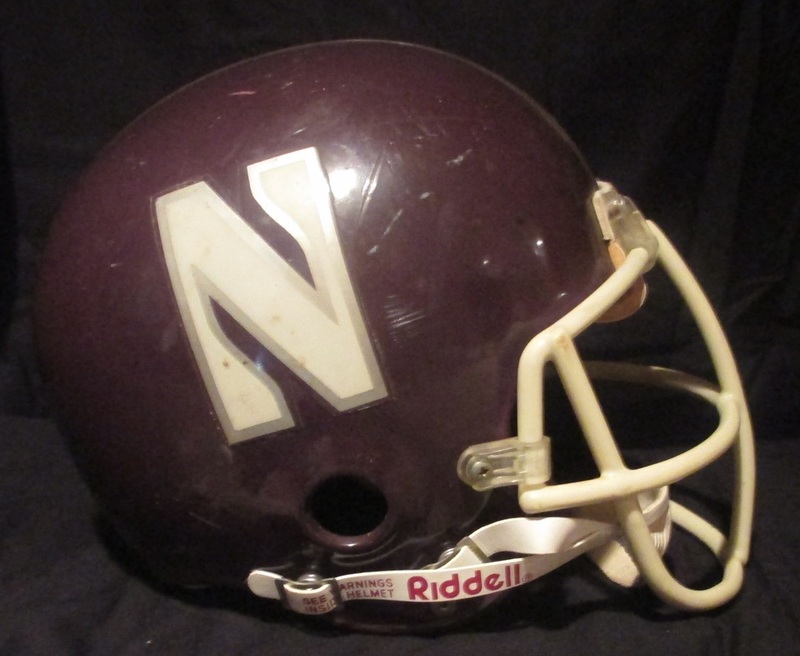 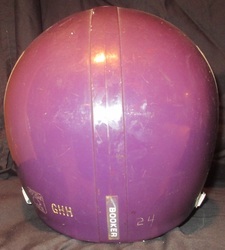 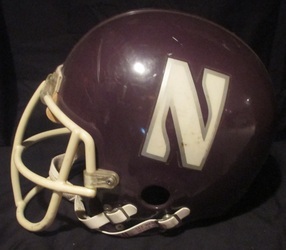 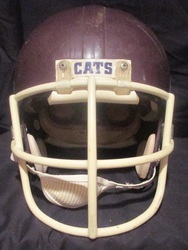 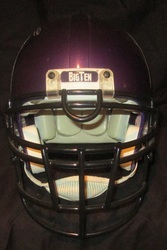 Northwestern Wildcats early 1980's Medalist model helmet worn by RB, Alex Booker, #24. 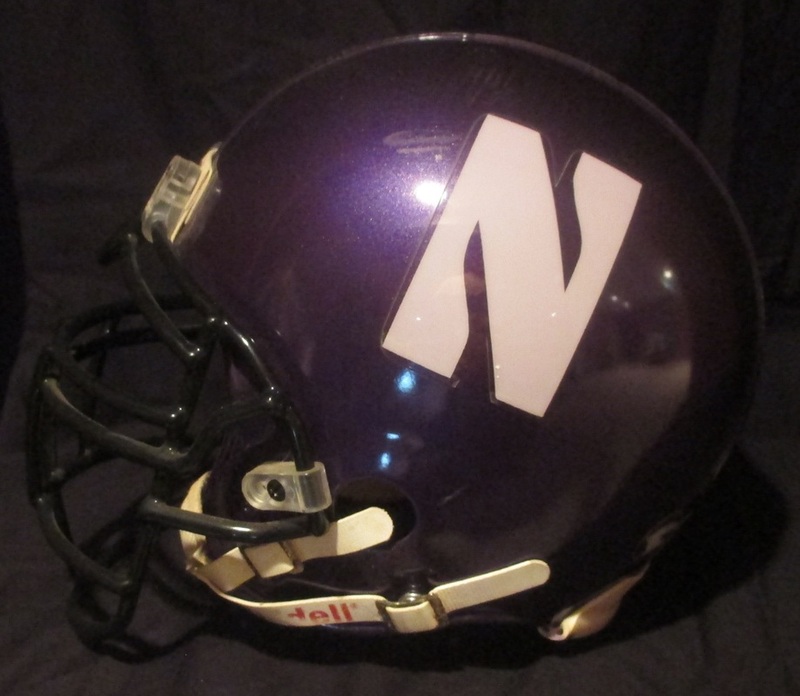 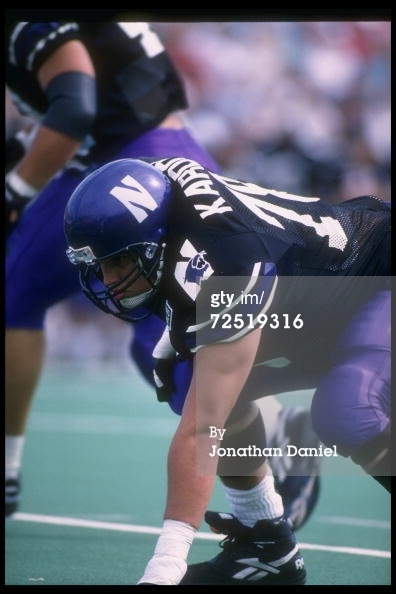 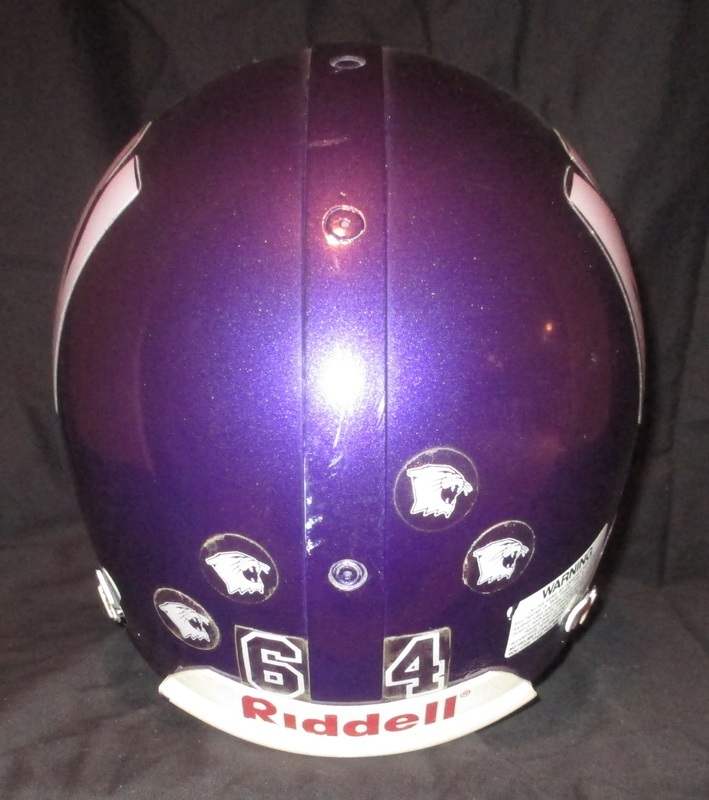 Northwestern Wildcats 1995 Riddell VSR4 model helmet, #64 with 4 award decals. 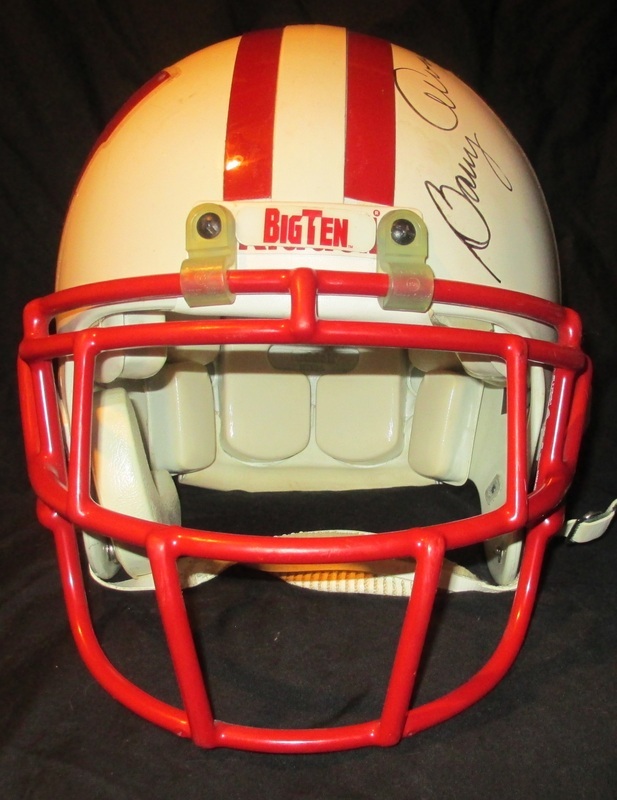 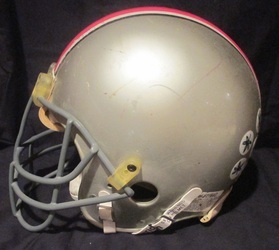 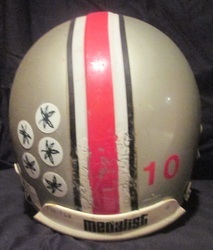 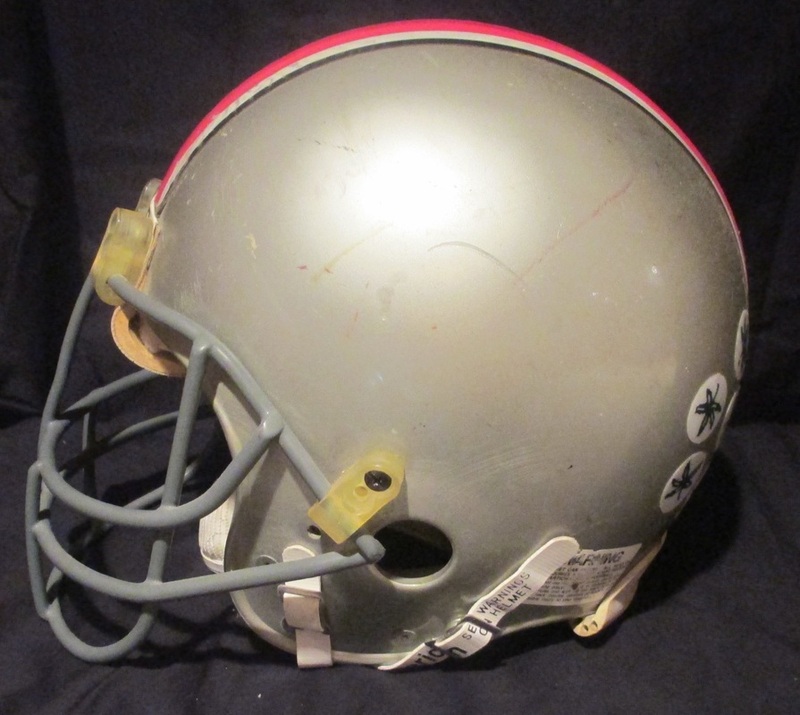 Ohio State early 1980's Medalist model helmet, #10 with 5 award decals. 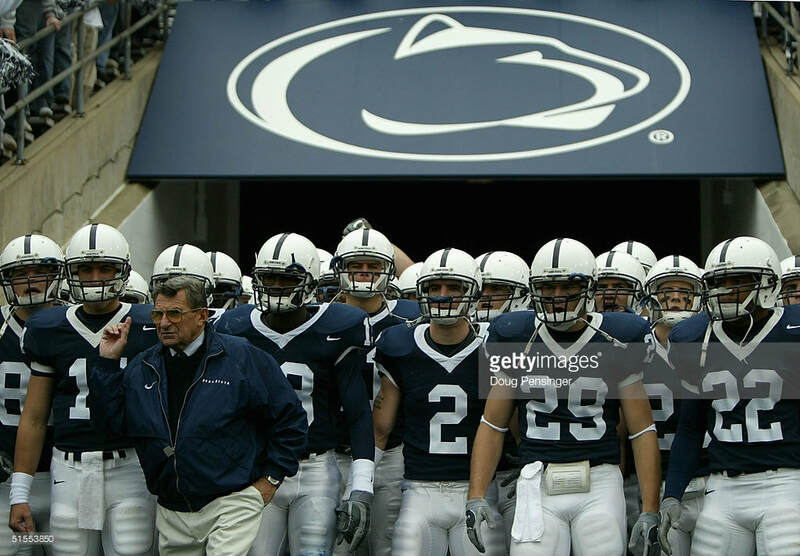 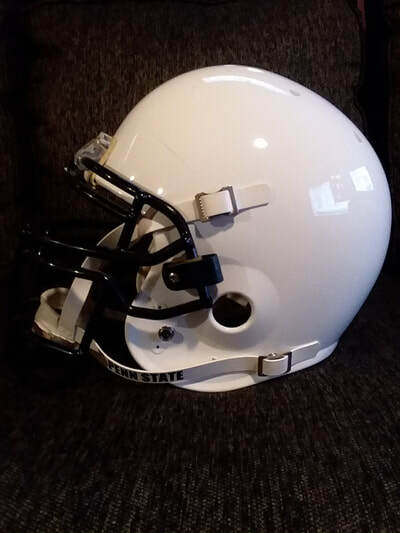 Penn State Nittany Lions Air/Schutt model helmet from the mid 2000's. 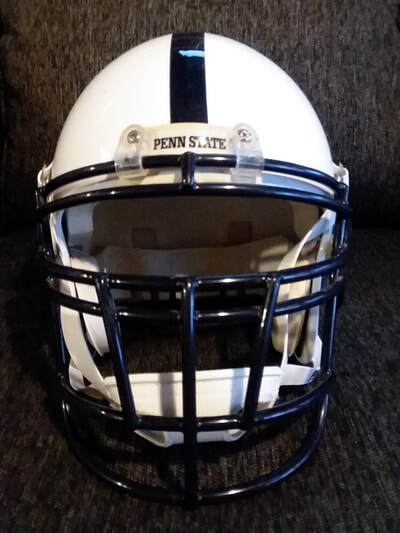 Penn State Nittany Lions Riddell model helmet. 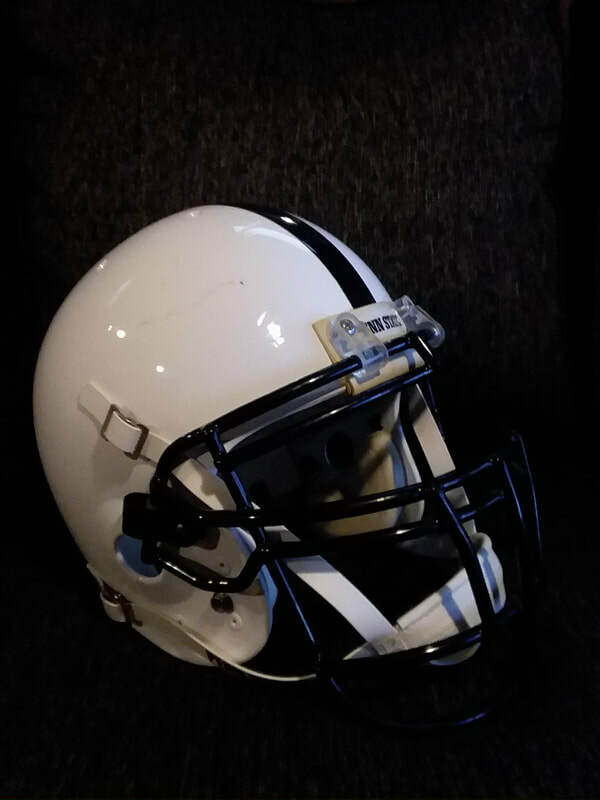 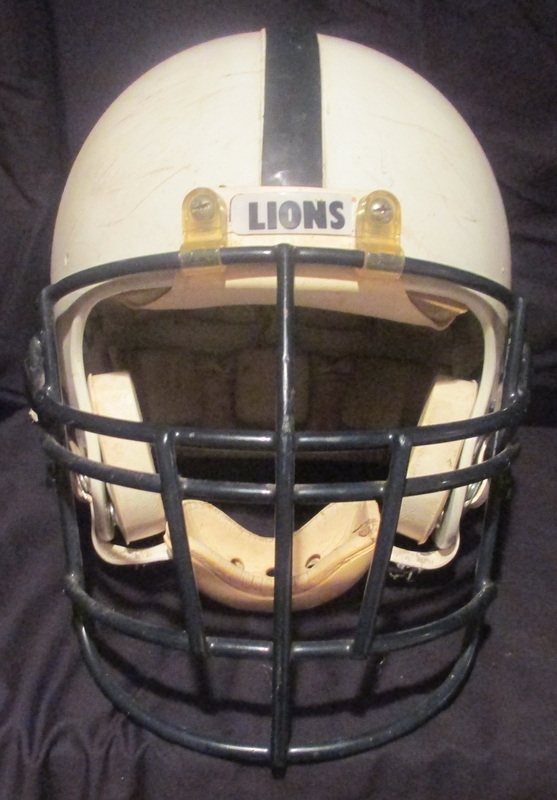 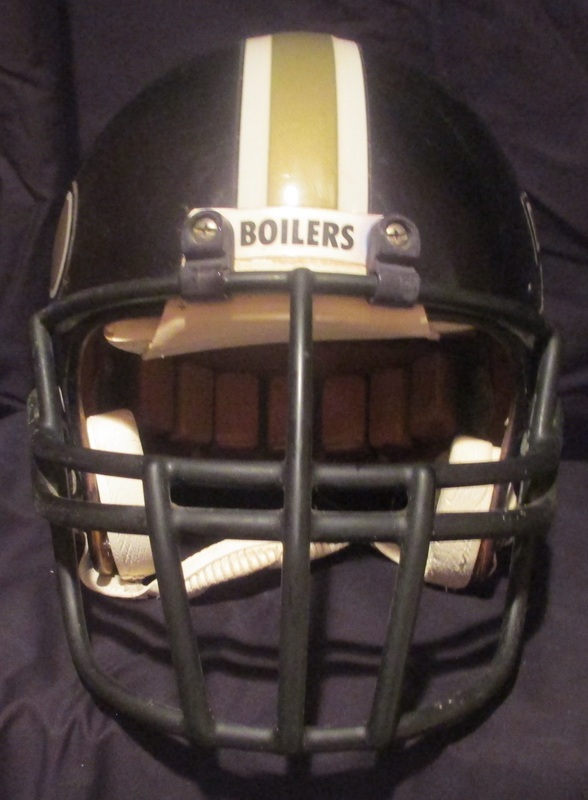 Purdue Boilermakers 1989-90 Riddell WD1 model helmet. 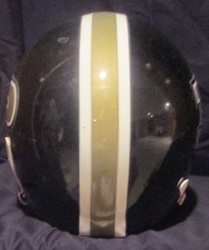 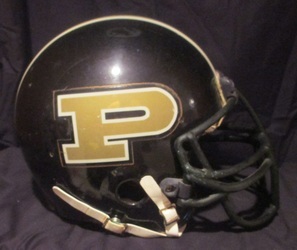 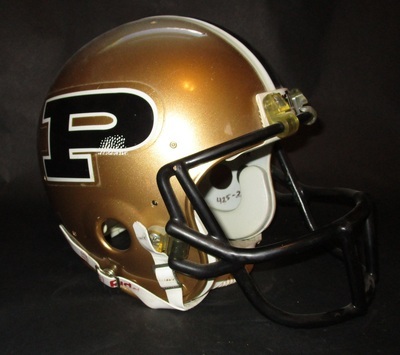 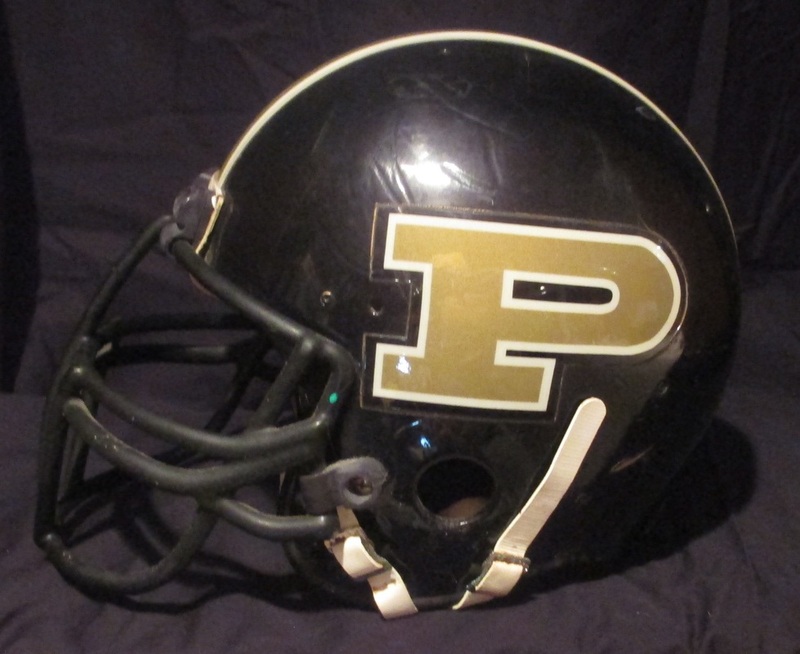 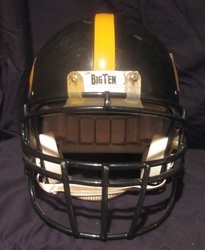 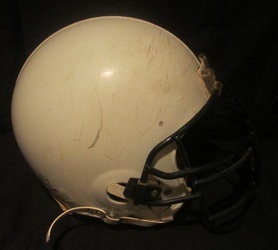 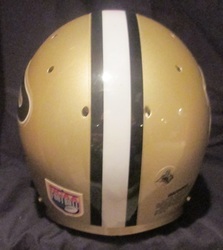 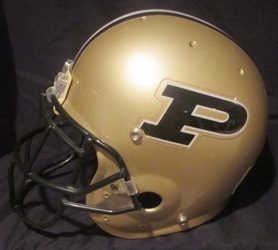 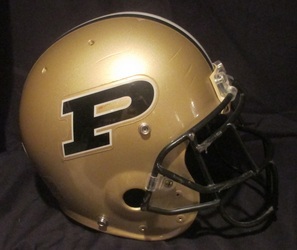 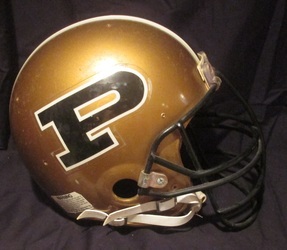 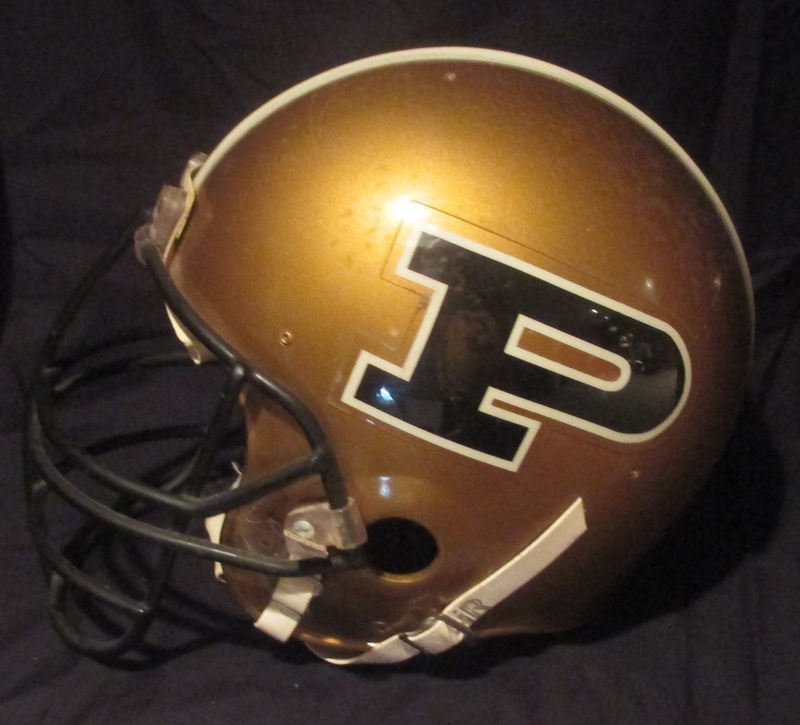 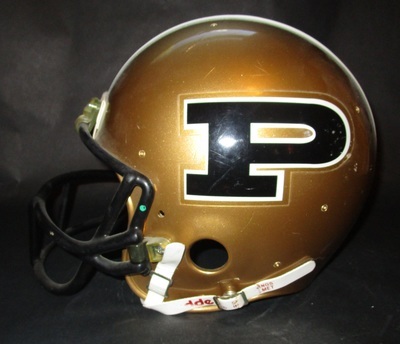 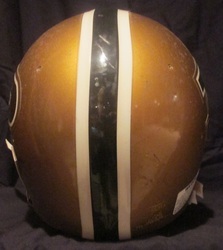 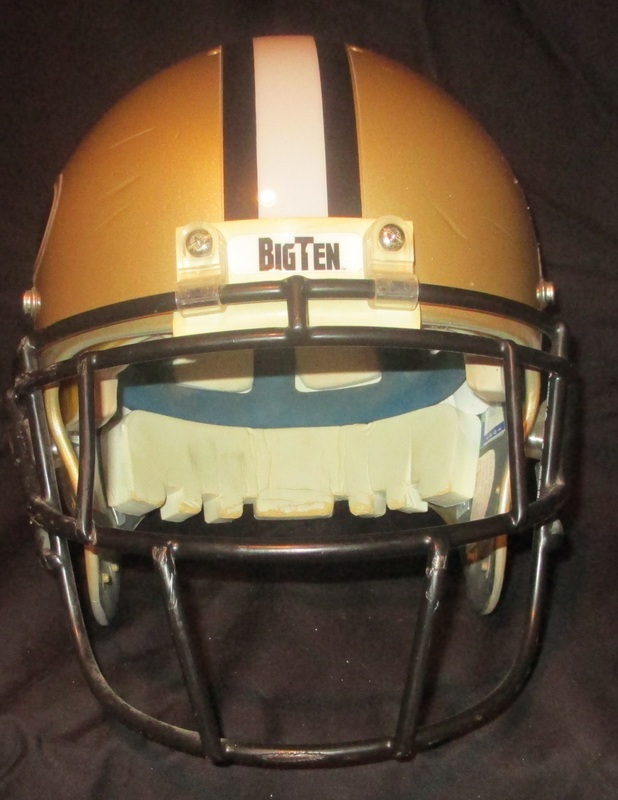 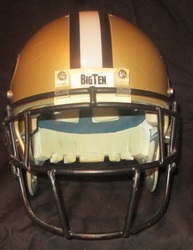 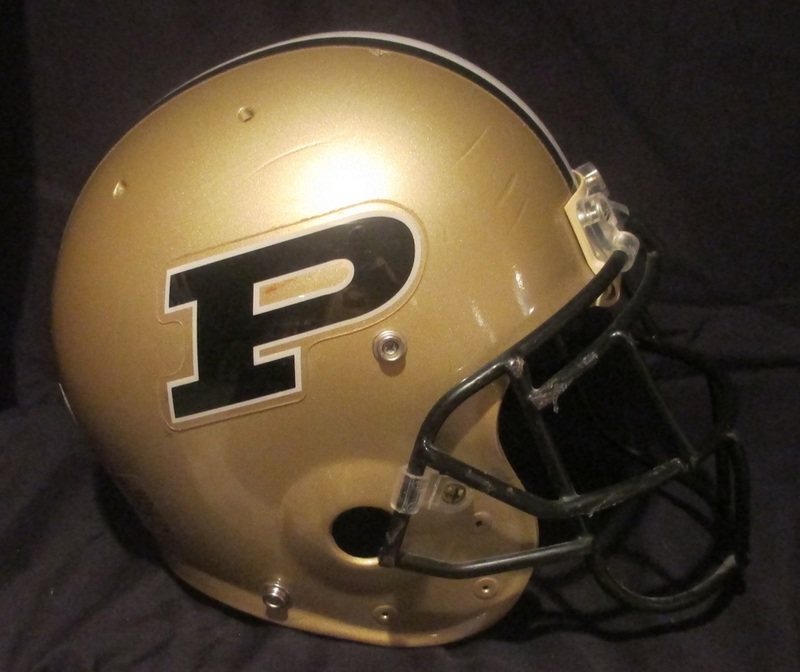 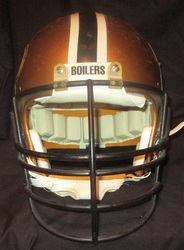 Purdue Boilermakers Riddell helmet from the 1991 season. 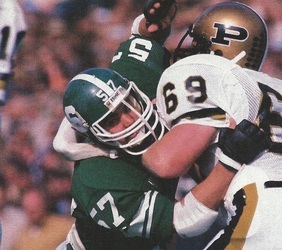 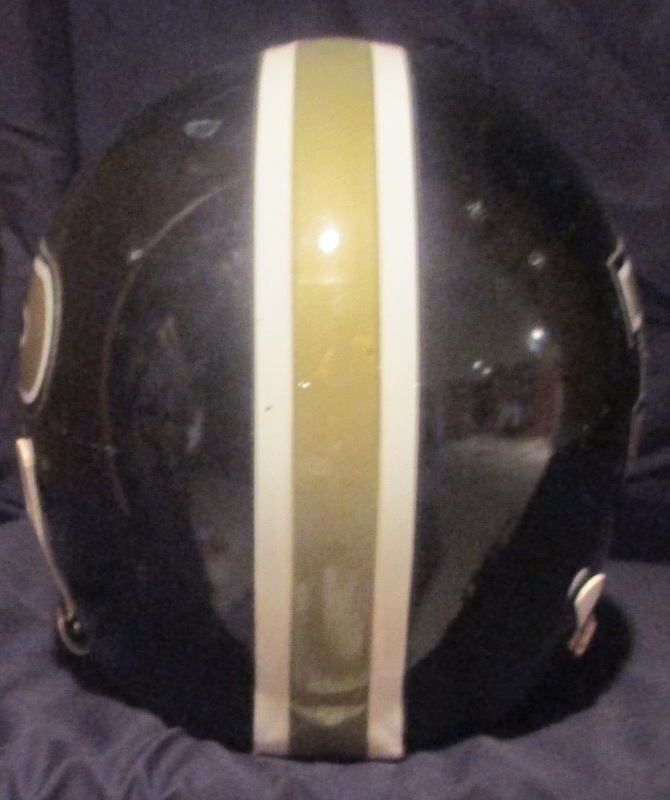 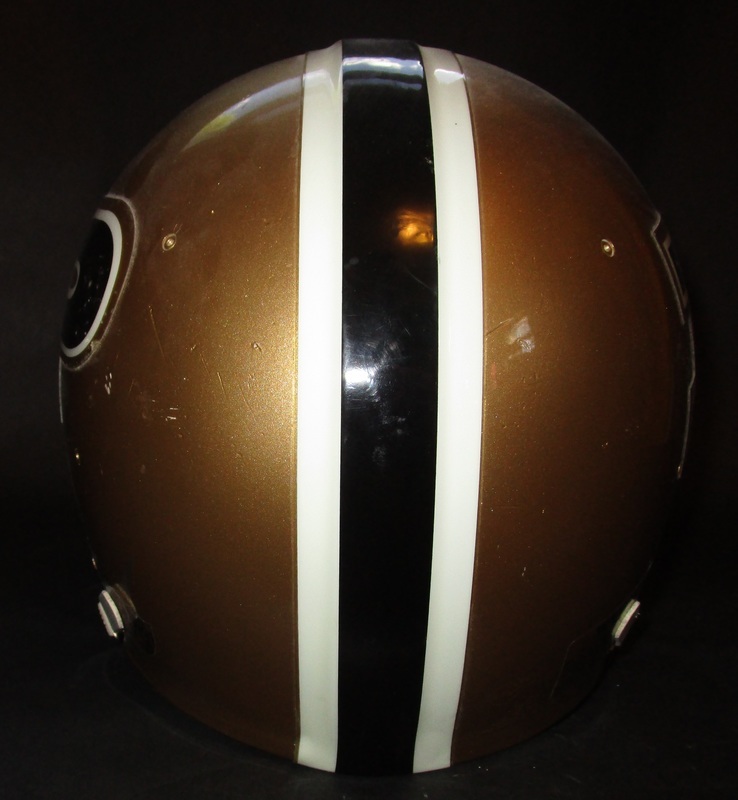 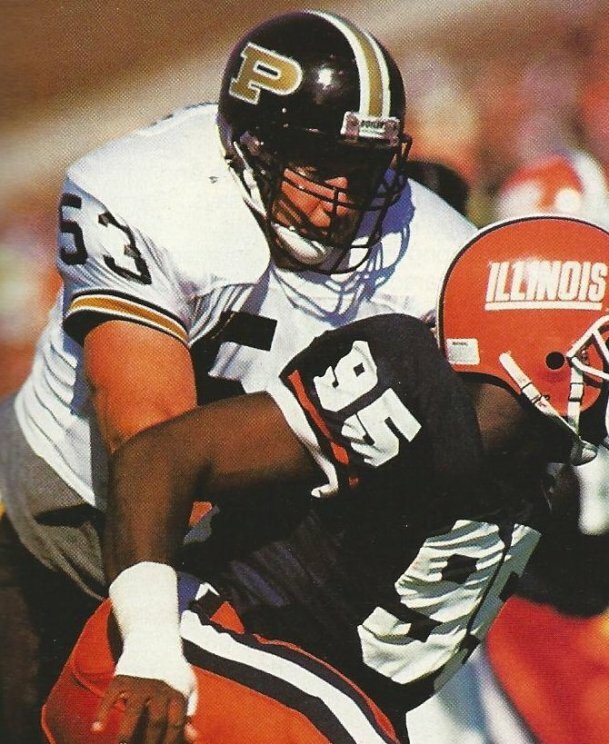 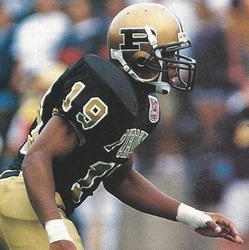 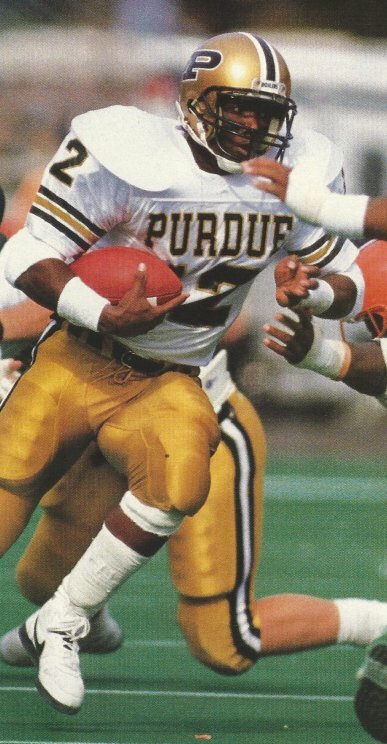 Purdue Boilermakers late 1980s helmet, player unknown. Purdue Boilermakers 1997 Air model helmet w/ NCAA sticker and one award decal. 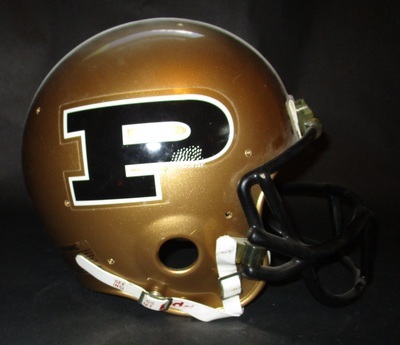 Straight out of the Purdue equipment room. 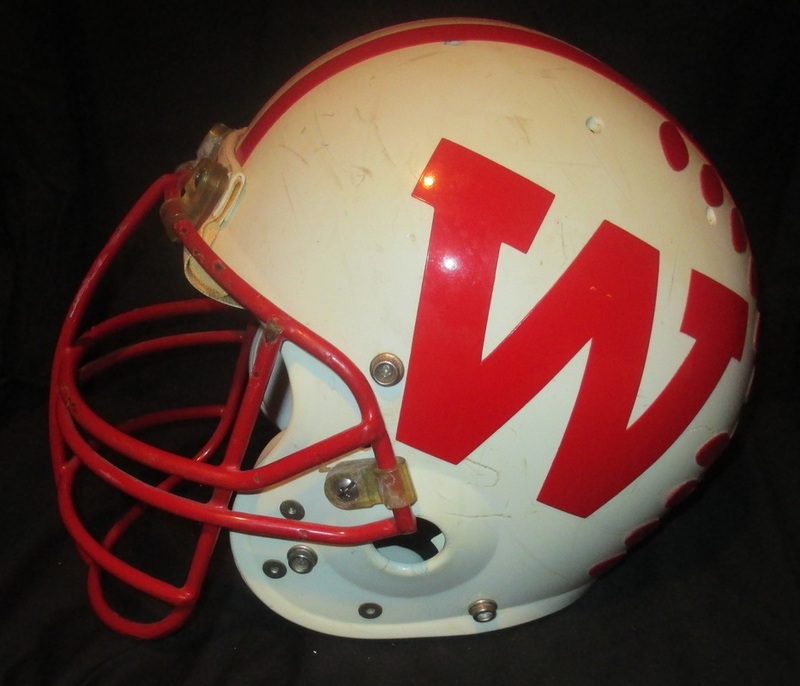 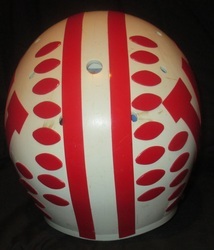 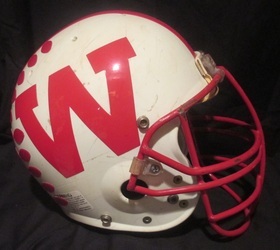 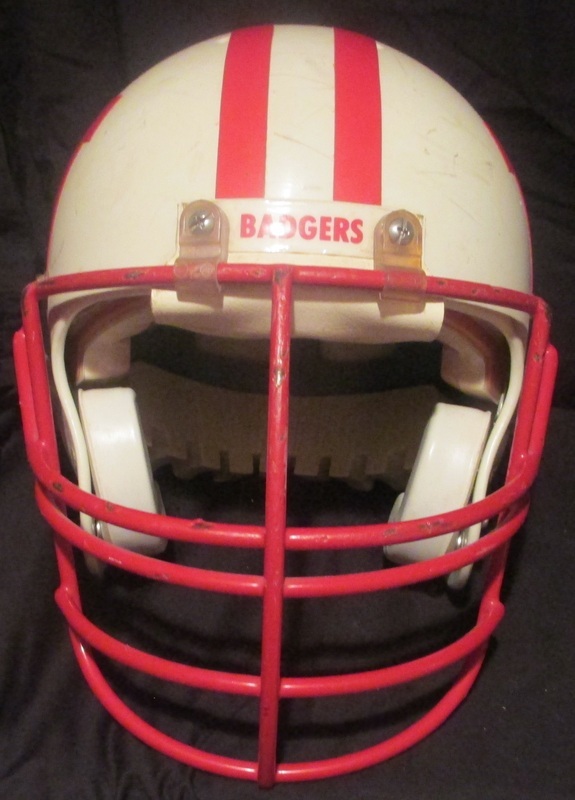 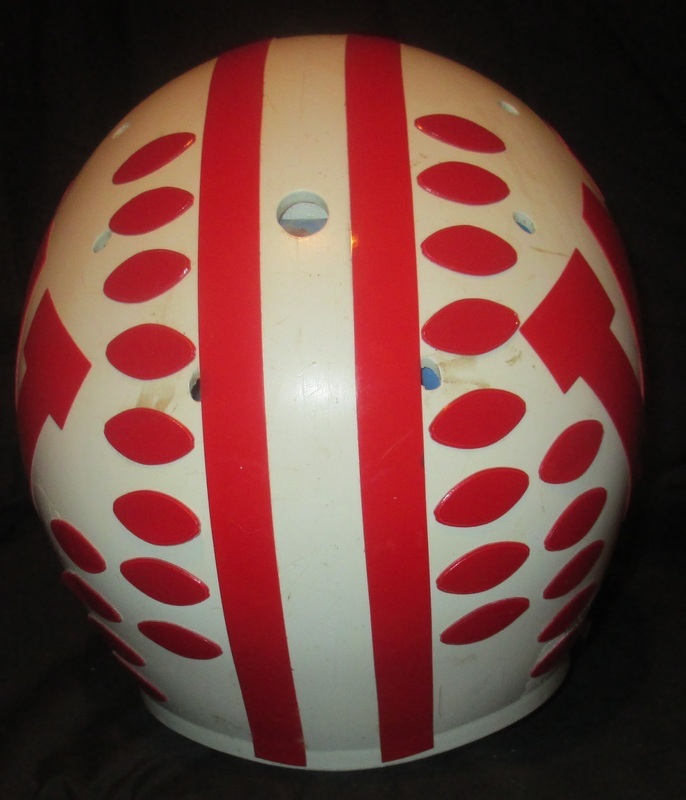 Wisconsin Badgers mid 1980's Bike helmet with numerous award decals. 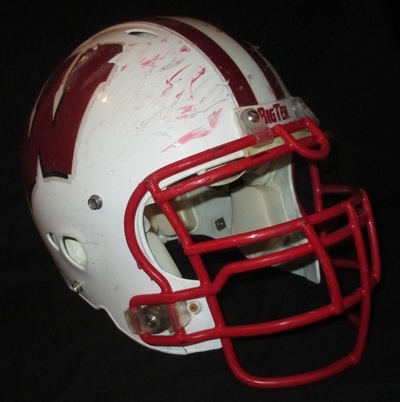 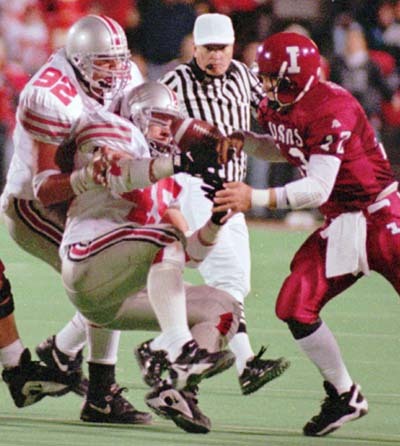 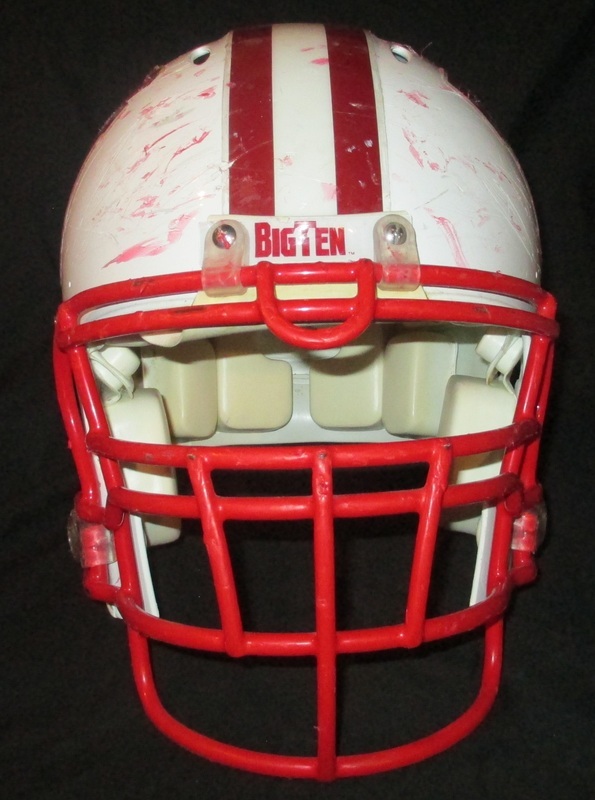 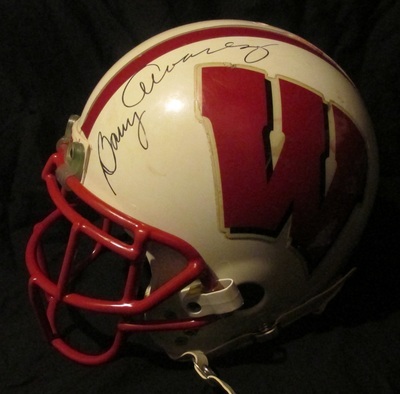 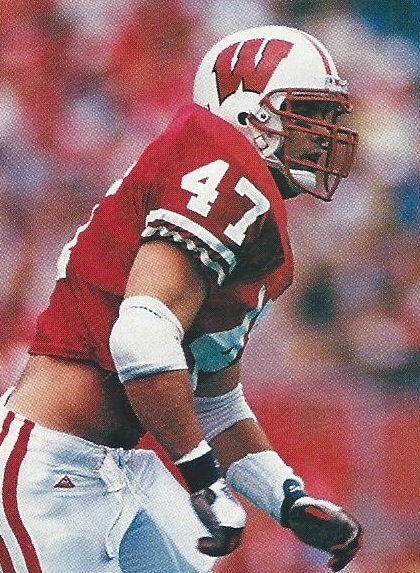 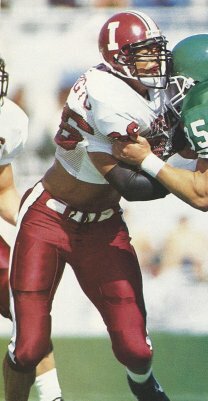 Wisconsin Badgers 1994 helmet, #28. 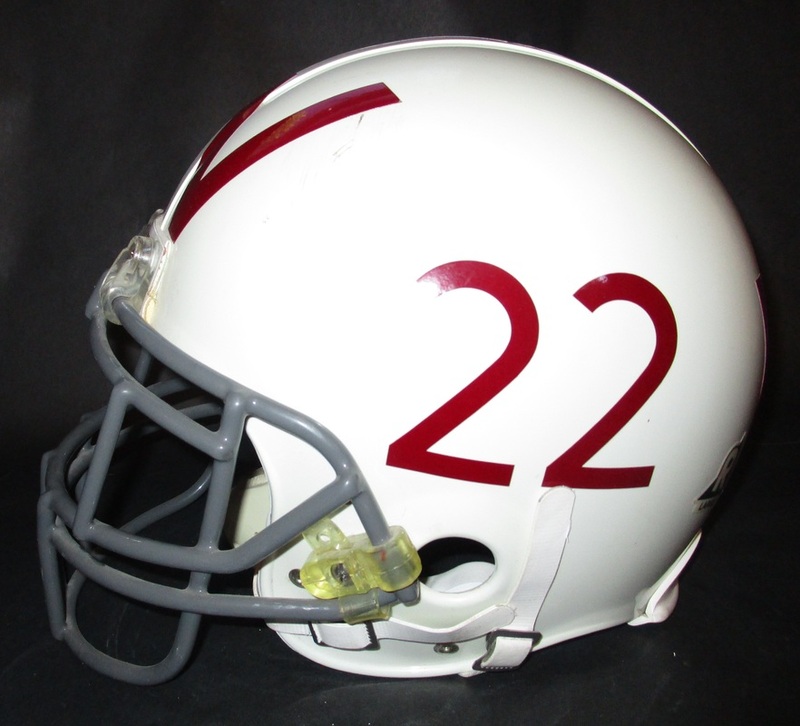 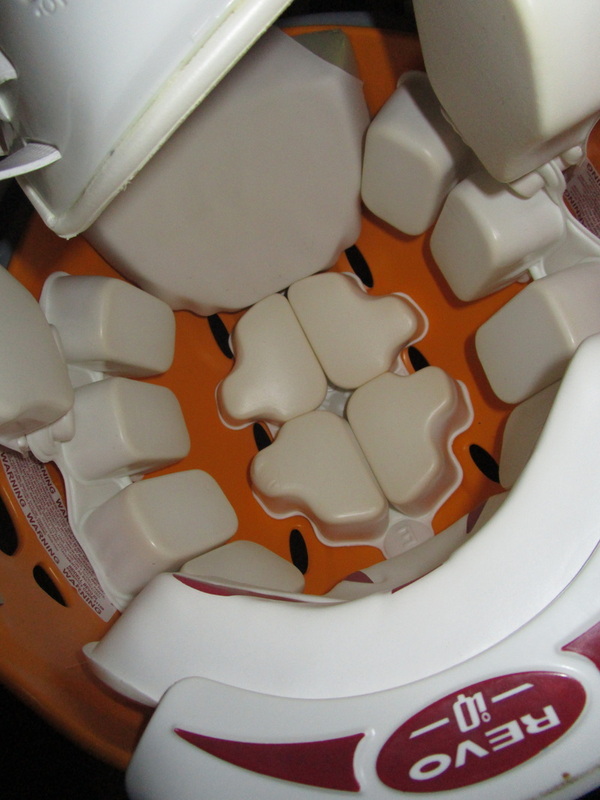 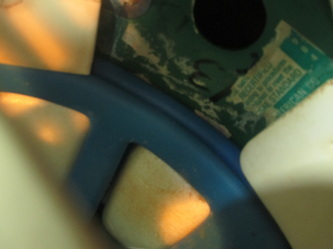 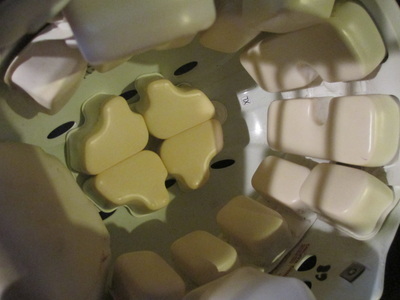 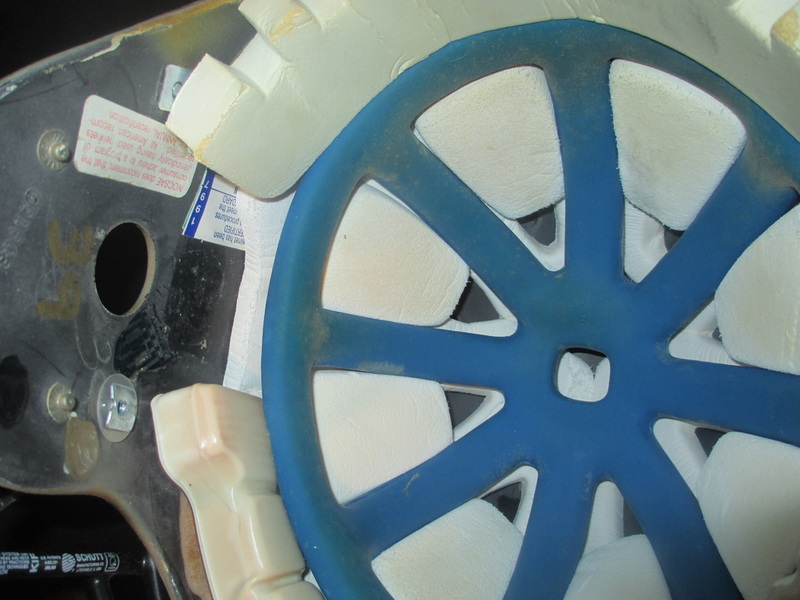 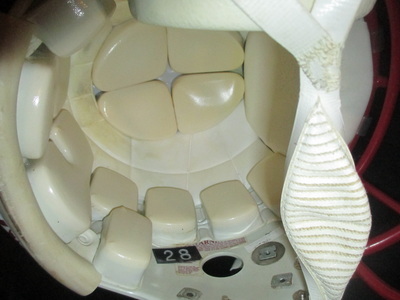 This helmet has #28 on dymo tape and a 2000 recon sticker inside. Signed by Coach Barry Alverez. 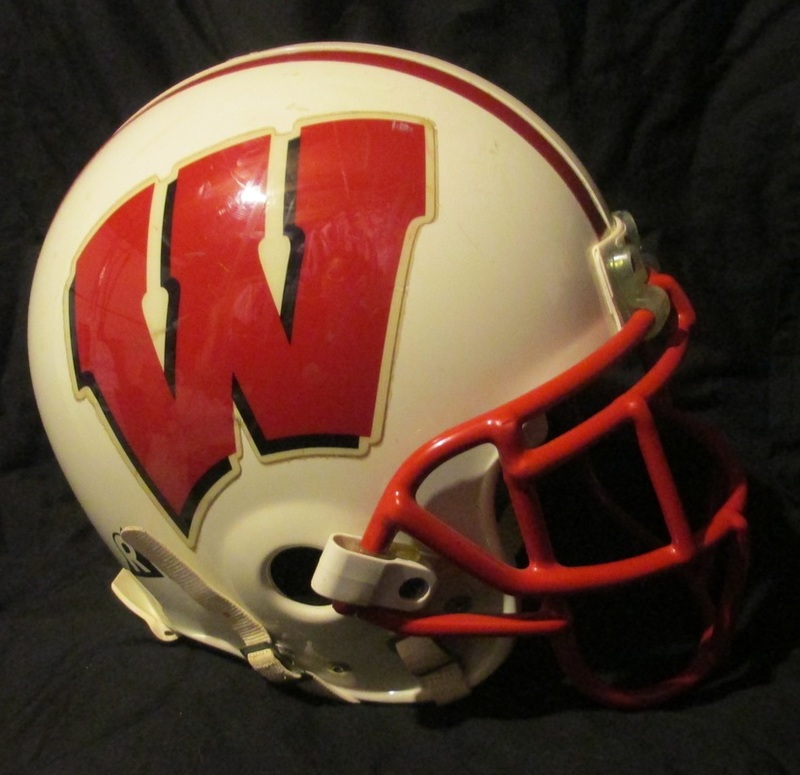 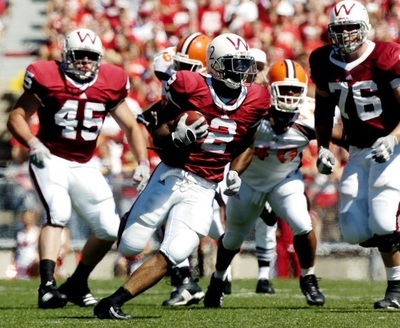 Wisconsin Badgers 2005 throwback, alternate helmet worn by DB Roderick Rogers, #22. 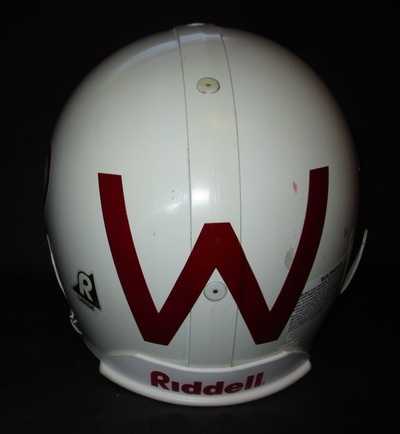 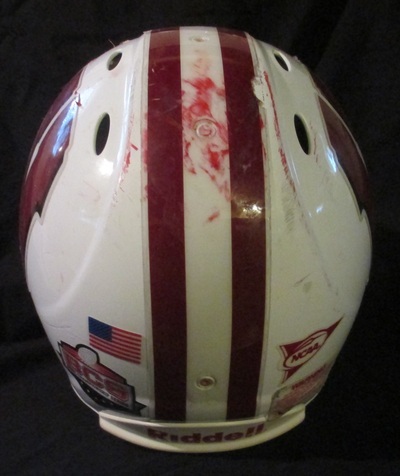 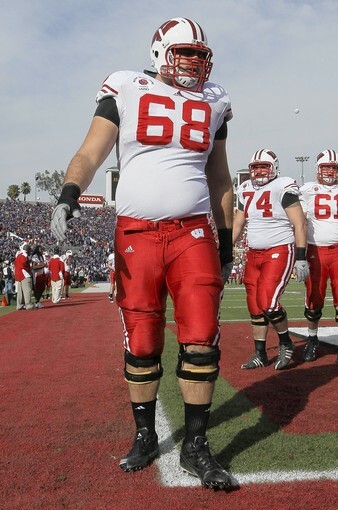 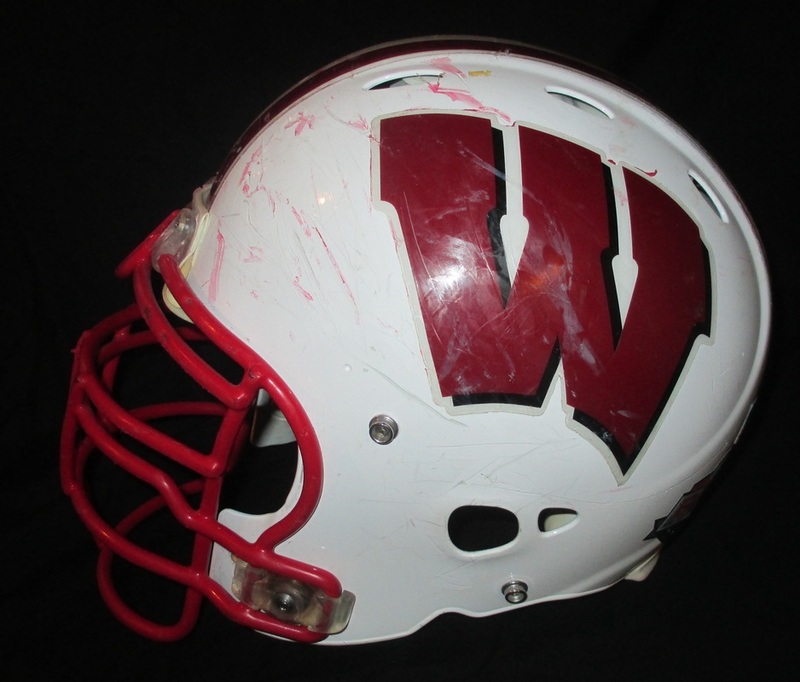 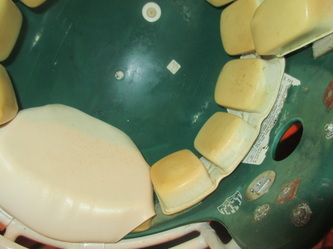 Wisconsin Badgers 2010 season football helmet worn by Gabe Carimi (2010 Outland Trophy and All-American winner) during the season and in the 2011 Rose Bowl vs TCU.